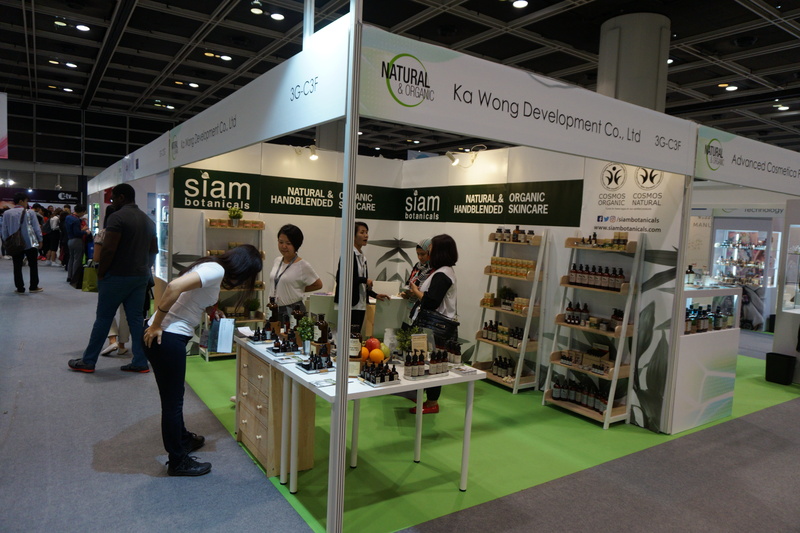 Natural & Organic was a new trade show area at the Hong Kong show this year. 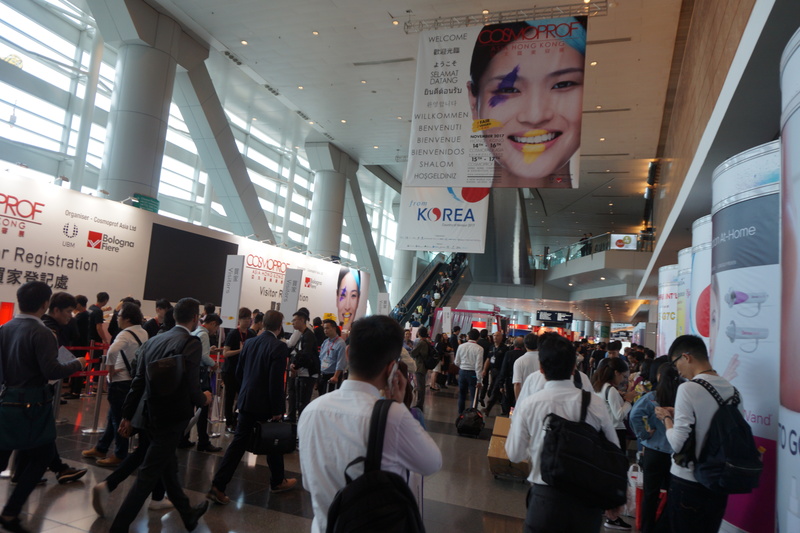 Over the past few years I’ve noticed more and more organic brands at Cosmoprof Asia but most of these companies were exhibiting within their respective country pavillions. 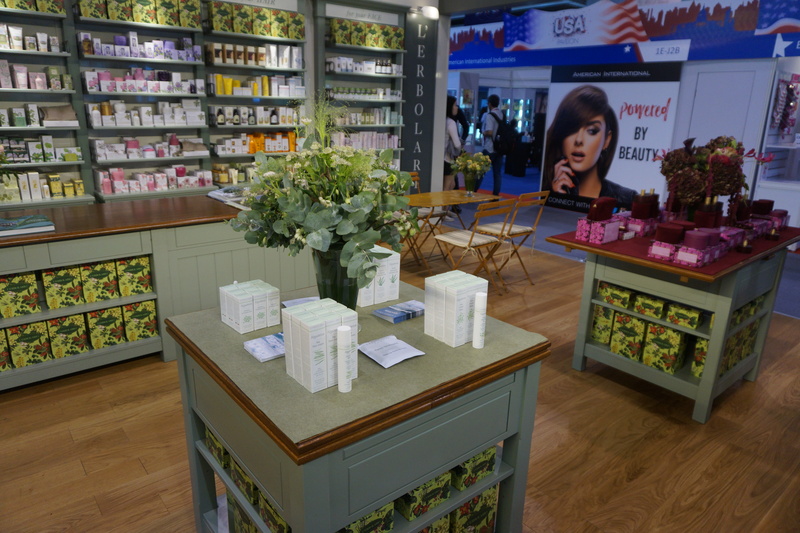 With the launch of Natural & Organic (a showcase similar to the Discover Green section at Cosmoprof North America), organic and natural brands now have the option of getting a booth in a green beauty area – and around 110 exhibitors did so, including a few brands that used to be located in Hall 1 downstairs. I spent the entire first day at Natural & Organic; there was so much to discover! 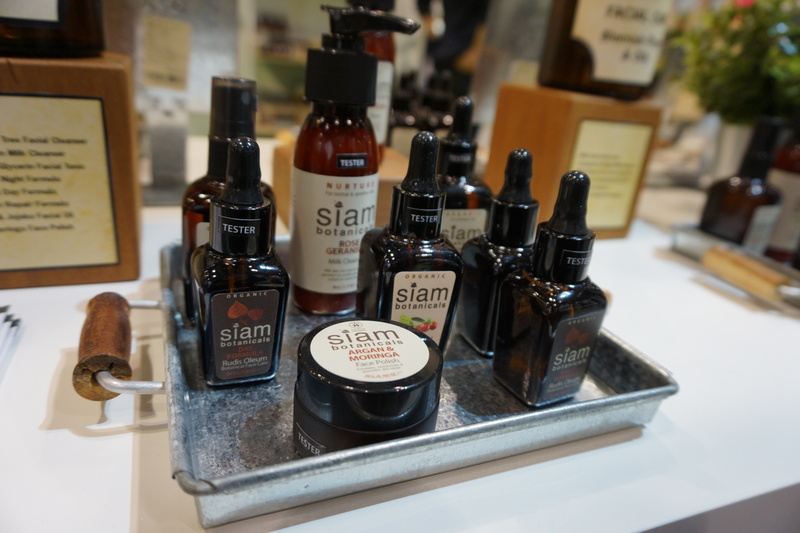 I had first met organic Thai spa brand Siam Botanicals at Natural & Organic Products 2016 in London. The brand offers high-quality and genuinely organic beauty products that are based on plant oils, hydrosols and herbal extracts. Since the London show I have seen Siam Botanicals at trade shows here and there and of course the company was also at Cosmoprof Asia 2017. Siam Botanicals is a spa brand so their product portfolio focuses on bath and body care, massage oils, solid perfumes, soaps and hair care. However, the company also offers a face care range and there were some interesting new product launches this year – like three new face oil blends: Cranberry & Jojoba, Raspberry & Passionfruit and Rosehip & Jojoba. 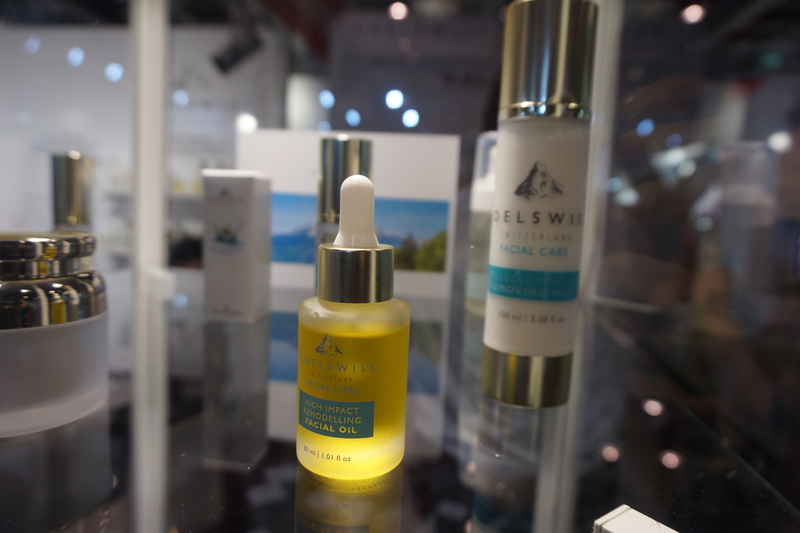 Korean organic manufacturer ENS Beauty Group was also at the show – they are, of course, the makers of Whamisa (see pic below), one of my favourite organic face care ranges EVER! I’ve been a Whamisa fangirl ever since I discovered the brand at Cosmetokyo 2014 and I am glad that their European expansion is (finally!) well under way. Whenever I am in Seoul I stock up on my Whamisa favourites. ENS Beauty Group also owns a number of other organic beauty brands which are less well-known than Whamisa, like Oolu (more about that brand further down! ), Beausome and New Days. Let’s start with Whamisa’s new launches – and my goodness, there were so many new products this year! An entirely new Whamisa skin care range is Organic Carrot Baby & Kids (see pic below): the eight products are based on carrot and oat kernel extracts and include a moisturising lotion, a body cleanser, a hair & body wash, a sun cream with SPF14, a sun cream with SPF50, a powder lotion, an oil balm and a SPF50 compact powder (for babies!). 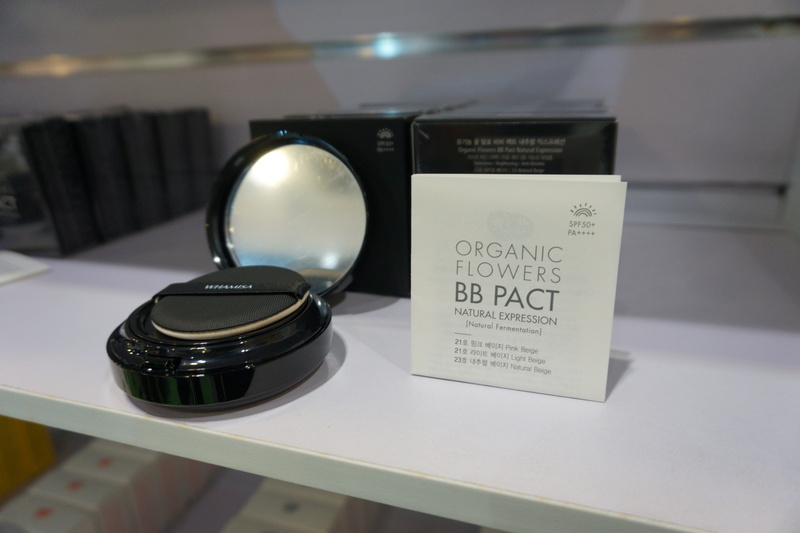 This brings me to another Whamisa novelty: the three Organic Flower Fermentation Pact Natural Expression BB cushion compacts (see pic above) which, in true Whamisa style, are based on aloe vera juice. There is also a new Cleansing Water; the three Peeling Finger Mitts (which I’ve seen on Instagram and various K-beauty blogs); the face creams are now packaged in plastic tubes rather than glass jars (an improvement! The jars were pretty but HEAVY. Plastic tubes are much easier to travel with); the Hydro Gel Masks were repackaged and there is a new Refresh Toner to join the iconic Deep Rich Toner and the Original Toner. 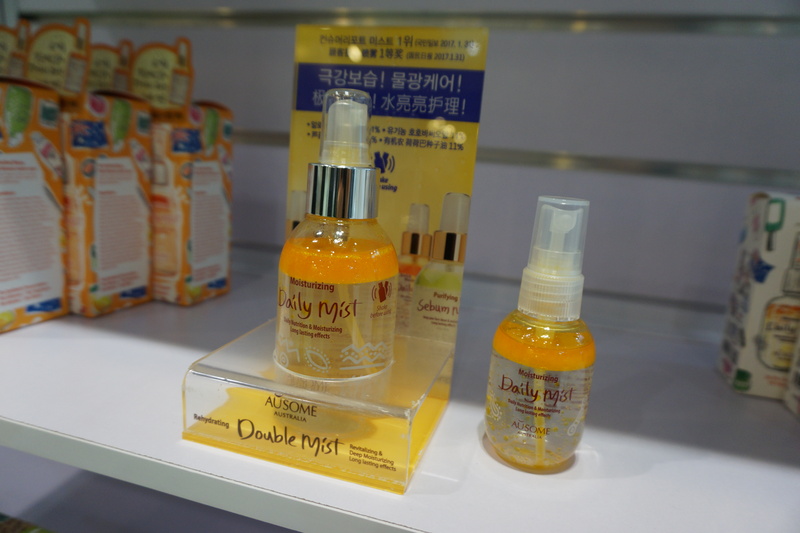 The Beausome range is from Australia (ENS Beauty Group is a Korean-Australian company so their product portfolio is rather international) and I currently have their Double Mist two-phase toner at home – I bought it in Seoul this April. Beausome has now extended the Double Mist toner range with Daily Mist (for normal skin) and Sebum Mist (for combination and oily skin) – both are beautifully moisturising two-phase sprays (see pic above). Finally, Oolu (picture below). I seem to remember seeing a couple of Oolu products once – I can’t remember which trade show this was (or was it a shop? 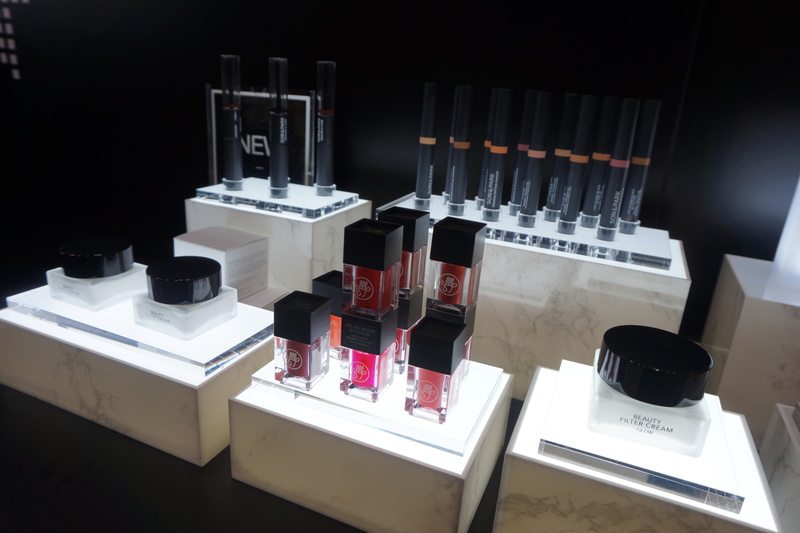 It might have been one of the Orga supermarkets in Korea) but it doesn’t really matter; ENS Beauty Group is currently relaunching and expanding the Oolu line. I was told that Oolu’s product range will eventually include 80 sku of skin and body care – all organic and at a premium price-point. 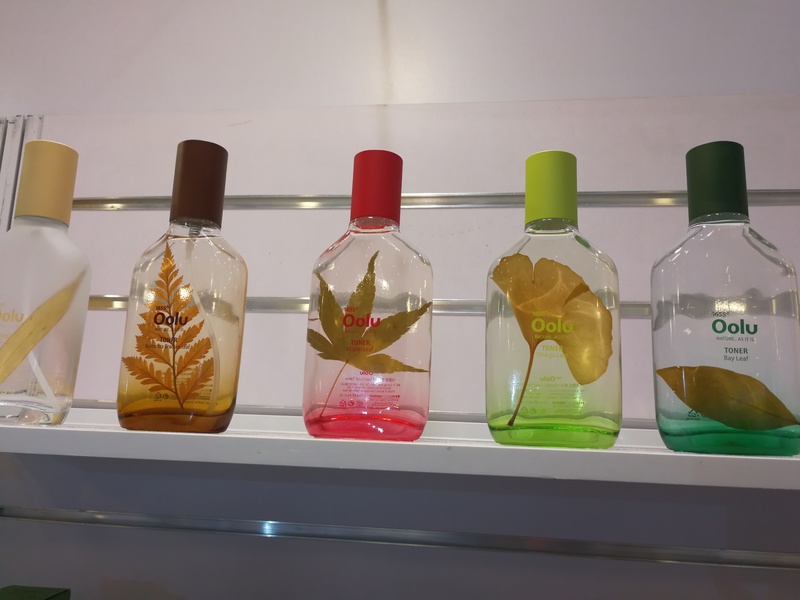 Like the Whamisa Olive Leaf and Rose face mists, the majority of Oolu bottles are made from clear glass and contain a leaf or flower which looks very pretty. I was told that Oolu will be launched by increments, 8-10 new products per month rather than the entire product range hitting the shelves all at once. However, ENS Beauty Group hasn’t yet decided on the distribution channel – online, offline; perfumeries, department stores? We’ll see. And soon, ENS Beauty Group will launch a new range: New Days is offering larger pack sizes of organic skin, body and hair care at affordable prices. Basically, New Days will be ENS Beauty Group’s mass market brand, Whamisa is the mid-priced range and Oolu will be positioned as the company’s premium product line. First-time exhibitor Adams is an organic personal care brand from Australia which specialises in water-free balms and oils, mostly baby care and body care. 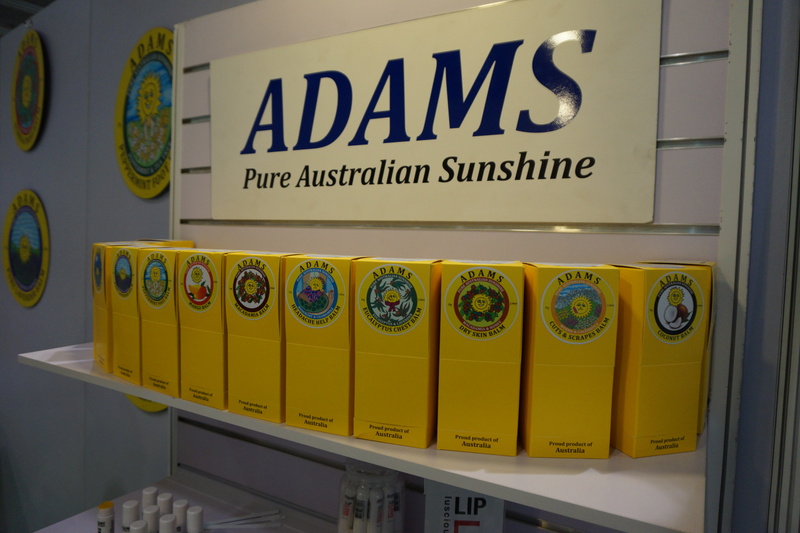 Launched in 1994, the Adams range offers 13 balms which are packaged in round metal tins. Variants include a stress relief balm, a lavender balm, a cuts & bruises balm, a foot balm and so on. There is also the 4-sku Sunny Baby range of body oil, bath & body wash, body powder and bottom balm, a lip care balm stick and the latest launch, Complete Facial with Sea Salt & Rosehip Oil which is an oil-based salt scrub. 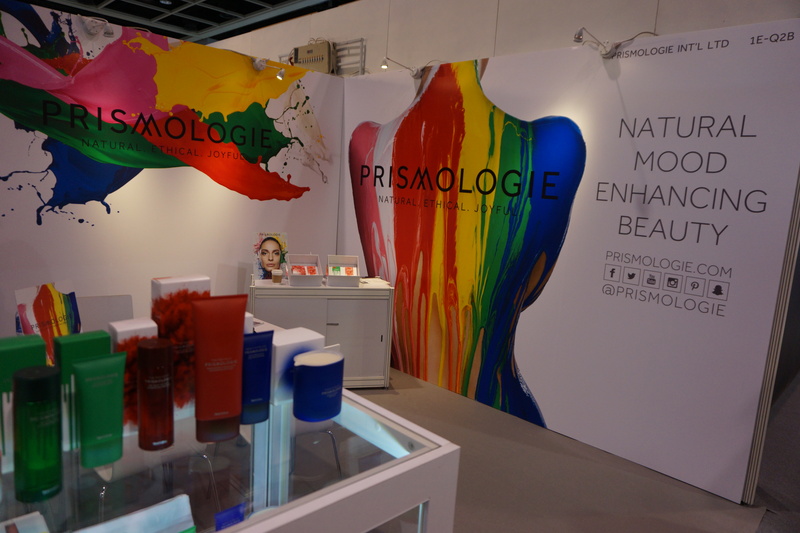 The brand was at Cosmoprof Asia to look for international distributors. 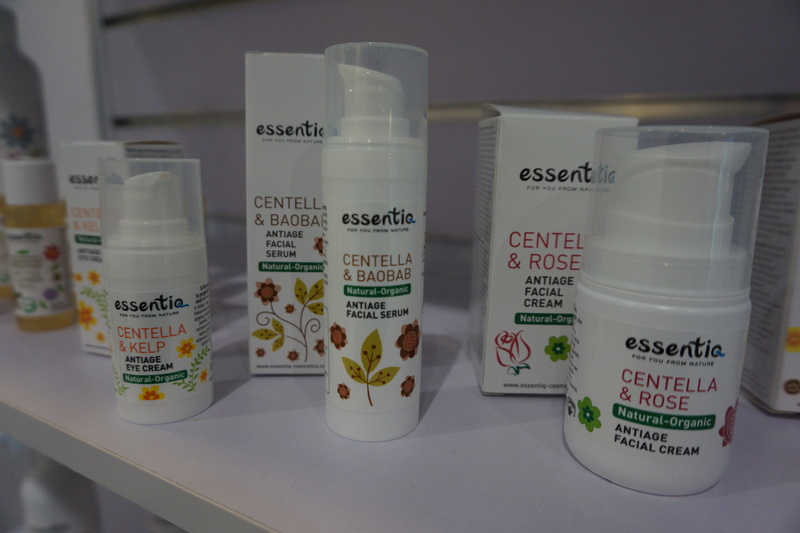 Organic beauty brand Essentiq from Slovenia was also at the show. I had seen Essentiq’s product range at Vivaness trade show in Nuremberg and in organic stores here and there but I didn’t know that the company also offers a salon-specific organic beauty brand and a premium beauty range – I only knew their shampoos and some of their face care. Well, Essentiq was launched in 2012 and its products are certified by ECOGEA Organic. Their retail range offers eight skin care products in total: a cleansing gel, a toner, a scrub, three face creams, a serum and an eye cream. There are also three body care products, four shower gels, two shampoos and six children’s skin and body care products, plus a small range of home fragrance products. In addition to the „normal“ retail range Essentiq has just launched a Professional beauty range which was developed together with 15 beauty salons in Slovenia. The Professional range is built around a individualised pick ‘n mix concept: there are 39 products in total which are divided into four groups – face cleansing base formulations, face moisturising base formulations, actives & concentrates and stand-alone serums. Depending on the individual skin care requirement of the customer, the salon treatment specialist blends different products together: adding actives or other concentrated ingredients to the basic cleansers or moisturisers. There are four cleansing products (milk, oil, micellar water and gel), two toners/hydrosols, four creams with varying lipid contents, two oil bases, a face butter, a face gel and a clay mask. This base products can be used on their own or customised with 20 different actives – powders, oils, liquids, gels; there are also five serums for specific skin care requirements. The range sounds really interesting (and I’d love to try it out) but, unfortunately, Essentiq Professional is only available in salons. Finally, there is Essentiq’s 5-sku premium range: Magic offers three face creams specifically formulated for different skin ages (30+, 40+ and 50+) as well as an intensive liquid moisturising lotion and a regenerating facial serum. Again, all products are certified organic and packaged in airless plastic jars. One of the most interesting product disoveries that first day was organic Italian brand Bema Cosmetici‘s new Blue Defence product range, see pic below. It’s a face care range which protects the skin against blue light (blue light rays) which are emitted not just by the sun but also by smartphones, laptops or LED screens. I had recently read about blue light cosmetics on German organic blog Beautyjagd so I simply had to stop and check out the Bema range. The Blue Defence line-up includes five products: a cleansing milk, a moisturising cream, a moisturising lotion, a peeling cream mask and an eye emulsion. All products contain Bema Cosmetici’s exclusive Visiblue Screen Complex which is based on knotgrass (polygonum), lycopene (a carotinoid), xantophyll (another carotinoid) and rice oil. 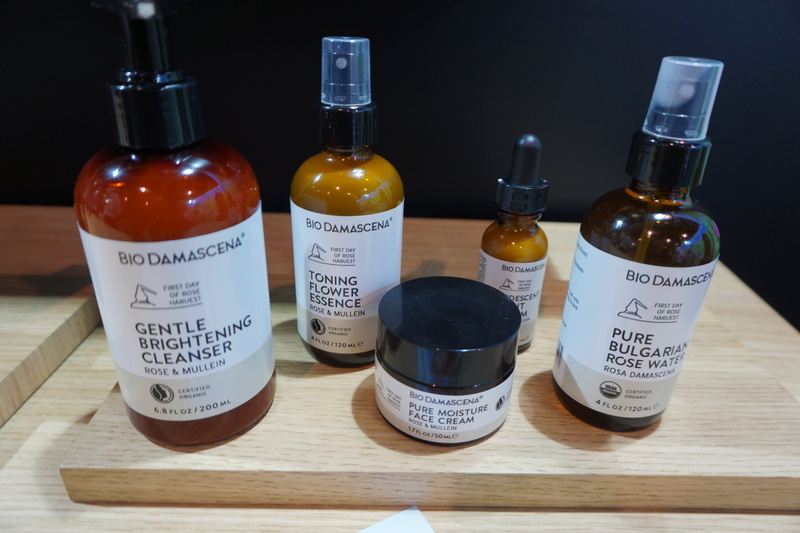 D’Alchemy was another exciting beauty discovery: the organic brand from Poland was launched this month and the product packaging is so stylish! The product formulations are good, too; based on plant oils, herbal extracts and hydrosols but the textures are light and comfortable. The 19-sku range has been designed for skin aged 35+ and offers four cleansing products, nine face care creams and lotions for different skin concerns, an eye cream and a neck/decolletage cream as well as four body care products. 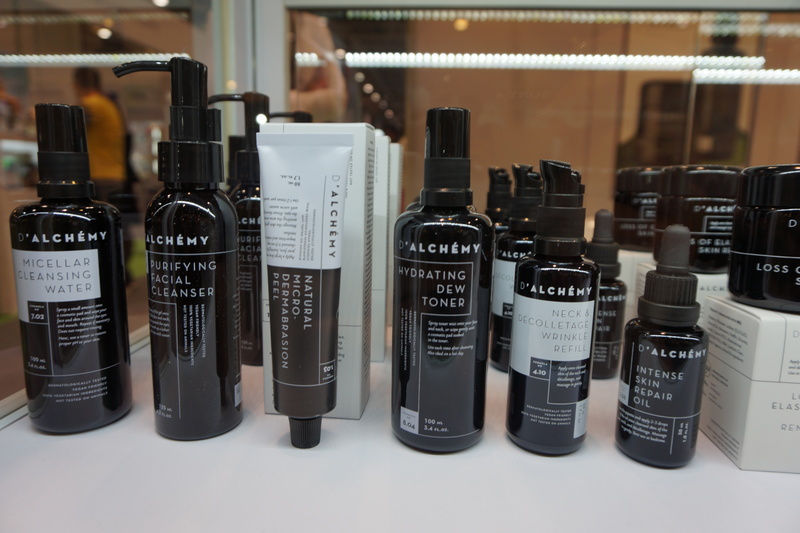 The brand is available online at the moment but D’Alchemy has just inked a distribution agreement with Sephora Poland – and if all goes well, I was told, the brand will be rolled out across Sephora’s other international markets. The company is also looking to expand into Asia and they were at Cosmoprof Asia to look for distributors. 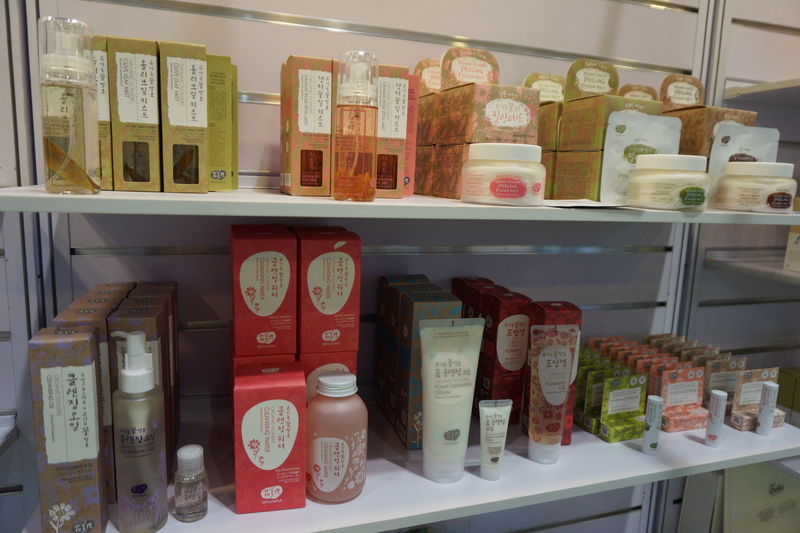 Organic Latvian brand Dabba was also at Cosmoprof Asia. I always enjoy seeing the brand’s distinctively packaged hydrosols (see pic below) – these plant water face sprays are still Dabba’s core product range although the company has been adding other skin and body care products to its portfolio in recent years. 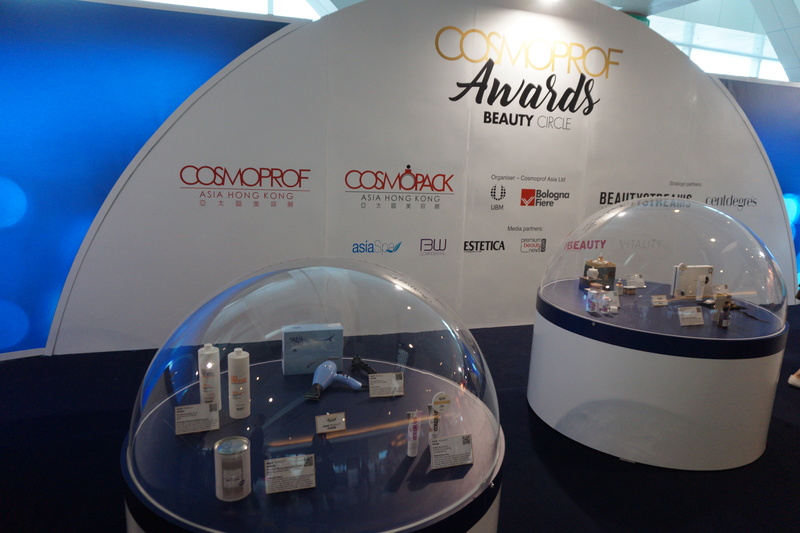 At Cosmoprof 2017 Dabba had no new launches to present but I was told that there were will be a whole host of novelties at Vivaness 2018 trade show in Nuremberg, including oil-free moisturisers/serums and even some face masks. There will also be a new organic men’s care range soon (which will not be marketed under the Dabba logo but still belongs to the company’s brand stable). I can’t wait to see Dabba’s new products at Vivaness next February! Dr. Jacobs Naturals is a body care brand from the US; they specialise in liquid castile soaps (doesn’t the packaging look a tiny bit familiar…?) According to the company website, Dr. Jacobs was launched in 2011 and I know that Dr. Bronner’s was launched well before that year which allows plenty of room to speculate who was influenced by whom….! Anyway, yes, Dr, Jacobs. Their core range is the 10-sku liquid castile soap line; Citrus, Rose, Lavender, Eucalyptus, Peppermint, Coconut and so on – the soaps are available in two pack sizes and can be used as a har or body wash. There are also five exfoliating bar soaps and three new liquid foam soaps. Dr. Jacobs’ latest castile soap launch features a trend ingredient – activated charcoal. 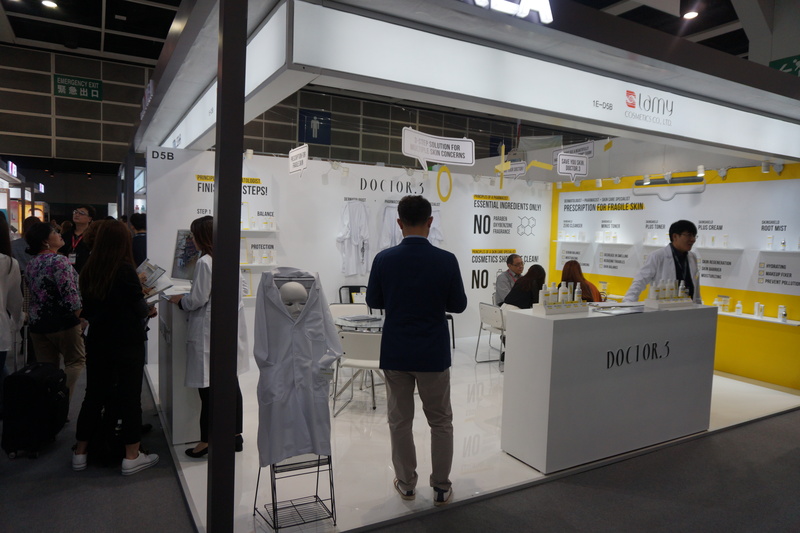 Indonesian C&T manufacturer Dion Farma Abadi (see pic below) was also at Cosmoprof Asia, in the Wellness & Spa section directly adjoining Natural & Organic in Hall 3G. 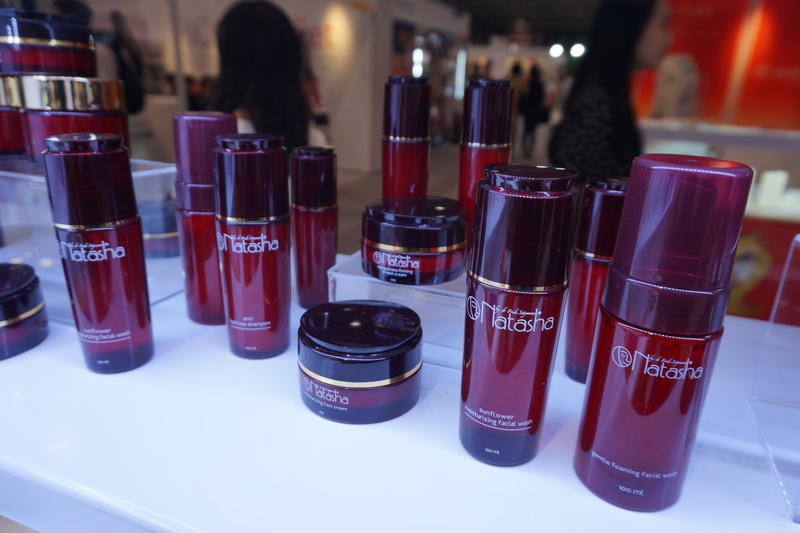 It was interesting to see their brand line-up: in total, Dion Farma Abadi owns 15 brands but the company brought only nine of these to the trade show, including their main skin care brand Natasha by Dr. Fredi Setyawan. Natasha (see pic below) is one of the biggest salon brands in Indonesia. The label was launched in 1994 and today the company operates 95 Natasha skin care clinics in 50 cities across Indonesia plus a salon in the Malaysian capital Kuala Lumpur. 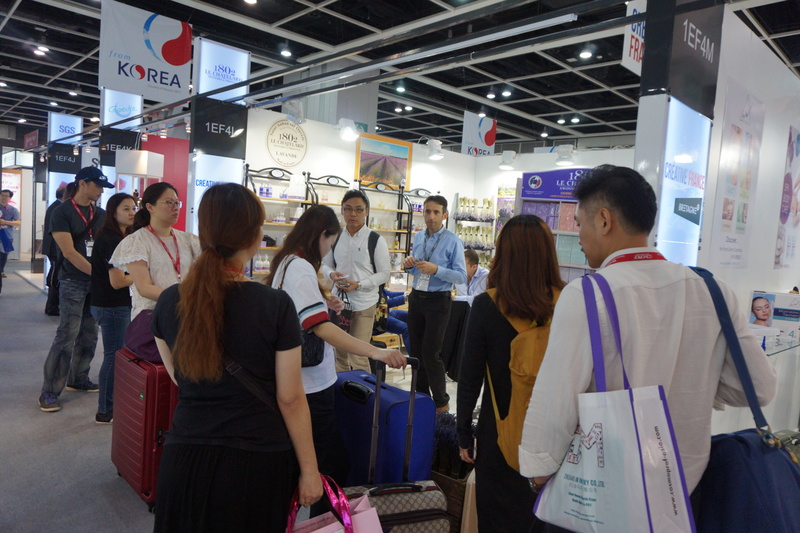 In its domestic market, Natasha offers around 100 sku of face care, hair care and body care but at the trade show, of course, Dion Farma Abadi only presented a small selection of their high-end face care products. 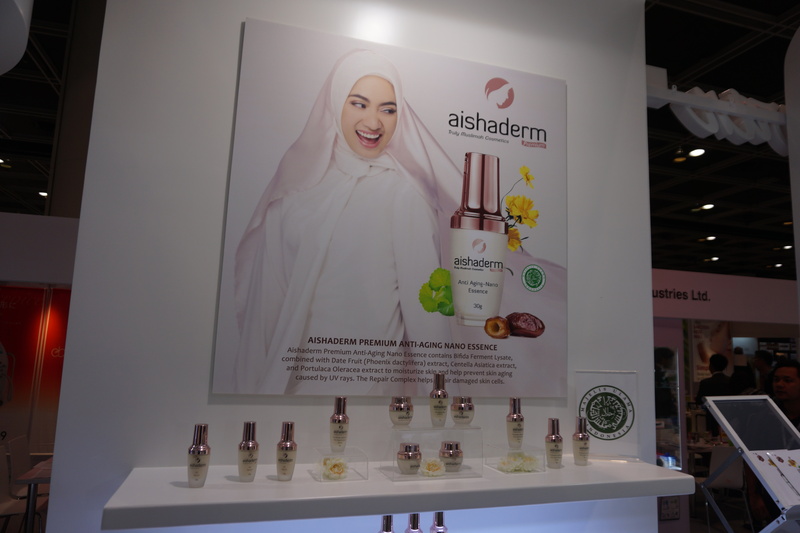 Another interesting Dion Farma Abadi brand is Aishaderm (see above), marketed as „Truly Muslimah Cosmetics“. Like all of the company’s brands, Aishaderm is halal certified and in Indonesia the brand offers around 50 sku. The products are stylishly packaged and contain phoenix dactylifera extract which is derived from Middle Eastern dates. The Aishaderm products presented at the show included a vitamin C serum, a whitening cleansing foam, an anti-ageing essence, a brightening serum, a eye care serum, a skin-lightening anti-discoloration serum, a protective day cream with SPF30, two shampoos, a hair growth serum and a conditioner. 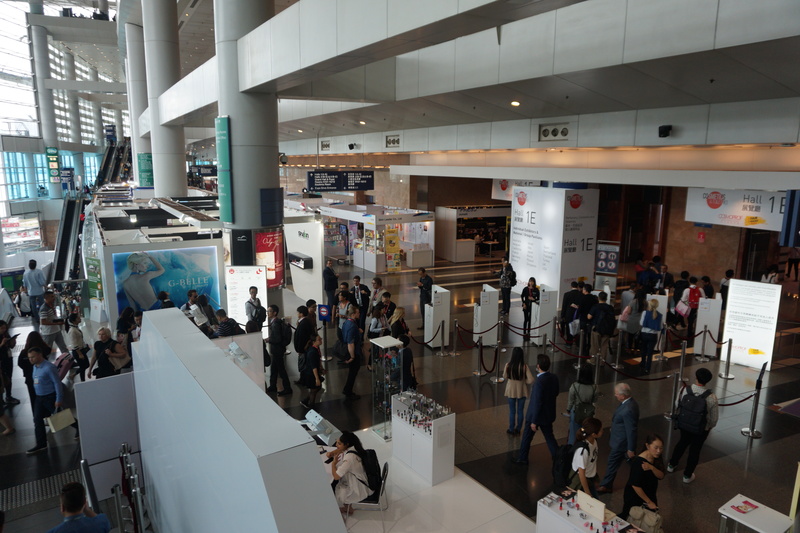 Hall 1 and the concourse outside is the main exhibition area at Cosmoprof Asia. This is where you’ll find the big international consumer brands as well as the major country pavillions. 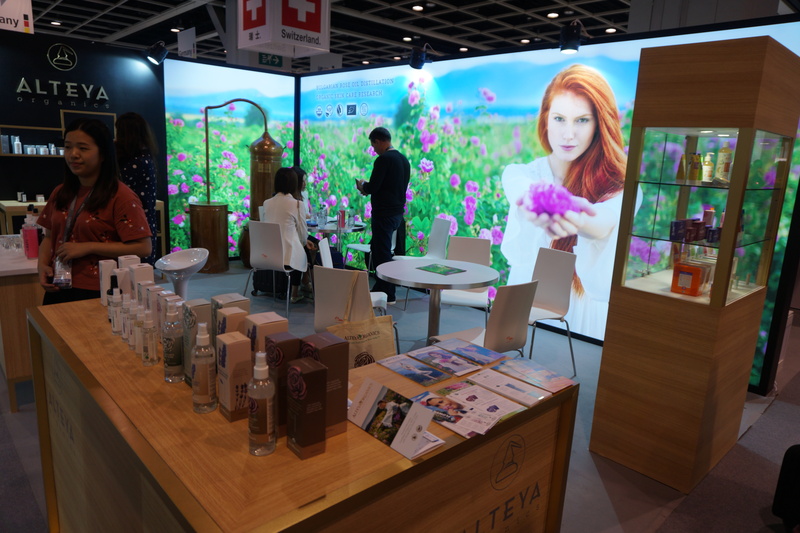 Organic Bulgarian rose beauty brand Alteya Organics always has its exhibition booth in Hall 1 and they usually present a whole range of new product launches at Cosmoprof Hong Kong – East Asia (especially Korea, Taiwan and Japan) is a key market for Alteya. I had last seen Alteya Organics at Vivaness 2017 trade show in Nuremberg this February. Since then, the company has launched a number of new product ranges, including two new shampoos and conditioners; the Rose Beauty Elixir (a rose water drink) and Rose Beauty Capsules (rose oil) nutritional supplements range and Bio Damascena, a new 5-sku face care range aimed at a younger demographic (see pic above). The new line offers a cleansing milk, a toning essence, a moisturising face cream, a brightening serum and a rose water hydrosol and the product prices are more affordable than Alteya Organics’ other rose beauty ranges. 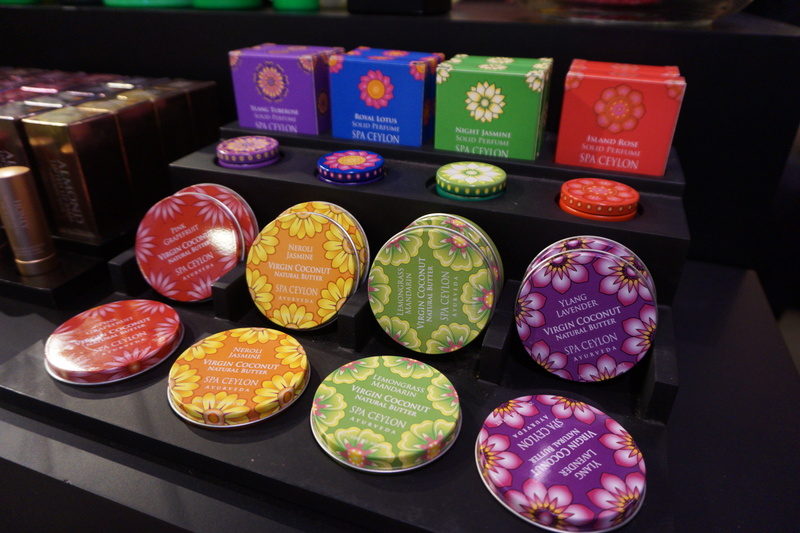 One of the companies in the European exhibitor area was Austrian organic brand Styx. The company’s products are widely available in Germany so I’m familiar with the Styx’ general line-up. 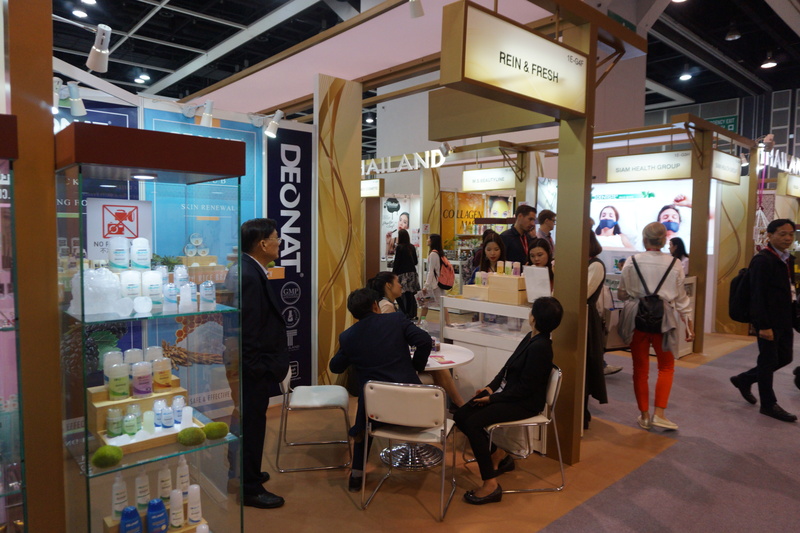 However, at the brand’s Cosmoprof Asia booth I immediately spotted a new beauty range packaged in sky blue and decorated with edelweiss flowers – and indeed, not only was Alpin Derm launched just four months but it’s also Styx’s first product range developed entirely for the Asian market. Alpin Derm’s eight products contain an Alpine plant complex which includes edelweiss extract gentian, hay flowers and yarrow as well as mare’s milk. Like all Styx products, the new range is certified organic – and apparently Alpin Derm is doing well; I was told that the products are already available in Taiwan and Thailand (with more Asian countries to follow soon) as well as China (through e-commerce, i.e. no animal testing). The Alpin Derm line-up includes a cleansing milk, a face toner, a face scrub, a vitalising cream mask, a moisturising fluid, a 24-hour cream, a hydro serum and an eye cream. German C&T company Artdeco group (or rather, its ICB Innovative Cosmetic Brands subsidiary) manufactures some of the most interesting German colour cosmetics and beauty brands – like the Artdeco makeup range, Anny nail polishes, colour cosmetics ranges BeYu, Make-Up Factory and Misslyn and salon beauty brand Malu Wilz. 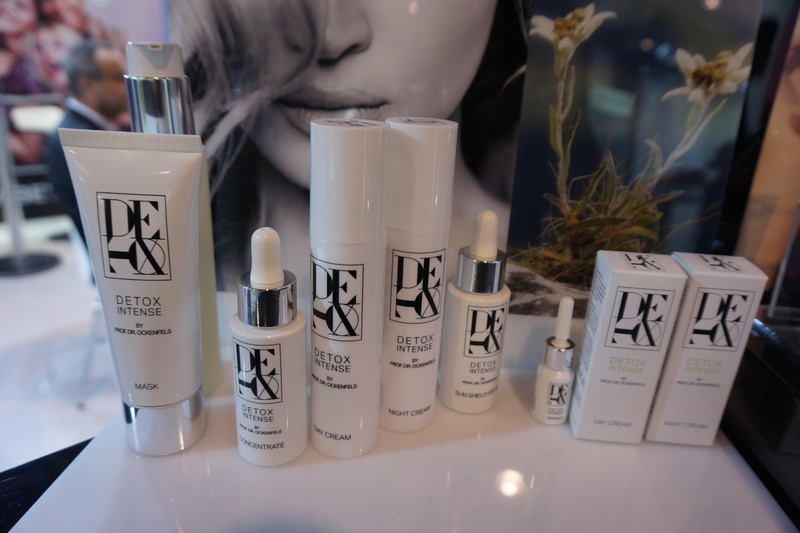 The latest ICB brand, Detox Intense, reflects one of THE skin care mega trends at the moment: anti-pollution cosmetics. These are beauty products formulated to help counteract the effects of modern day life on our skin: stress, bad nutrition, little sleep, too much alcohol or sugar or sun exposure. Another big factor in skin ageing is, of course, smog and air pollution (a particularly serious concern in Asia’s mega cities) which explains why anti-pollution skin care is such a big trend in this part of the world. Anyway, Detox Intense (see picture above) was launched just a few months ago; the products were developed by German dermatologist Dr. Ockenfels and the range offers six sku. There is a cleanser which is formulated with goji extract, cranberry extract, blackcurrant extract and Exo-P complex; a gel mask which contains activated charcoal beads that dissolve when you smoothe the mask onto the skin. The range also offers a detoxing concentrate with African black bean extract; a day cream with the special Sulfora-White complex and vitamin E; a rich night cream with Majestem complex, hemp oil and provitamin B5 and, my personal favourite, Sun Shield with SPF 30. This sun protection product is a clear serum which goes on smoothly without stickiness or whitening. Oh yes, all Detox Intense products also contain antioxidant edelweiss extract. In Germany Detox Intense is retailed in exclusive spas and salons and in January 2018, distribution will start in Switzerland, Holland and Austria. More anti-pollution skin care, this time from Switzerland! Jaqueline Piotaz Switzerland is Swiss dermo brand which specialises in premium Swiss-made skin care products. The company was lauched 7 years ago and is sold primarily online. The portfolio offers a number of luxury ranges, like the 5-sku Triple Plant Stem Cell Plus Collection and the 4-sku Advanced Cell Power Experts anti-ageing range. Jaqueline Piotaz’ Pollution Defense range was launched in November 2017 and offers detoxing skin care which is claimed to help protect skin against the ageing effects of air-borne pollution. The four products contain the brand’s proprietary AutophaCell Complex and the line-up includes a purifying foam cleanser, a moisturising intensive serum, an eye care fluid and a protective day & night cream. 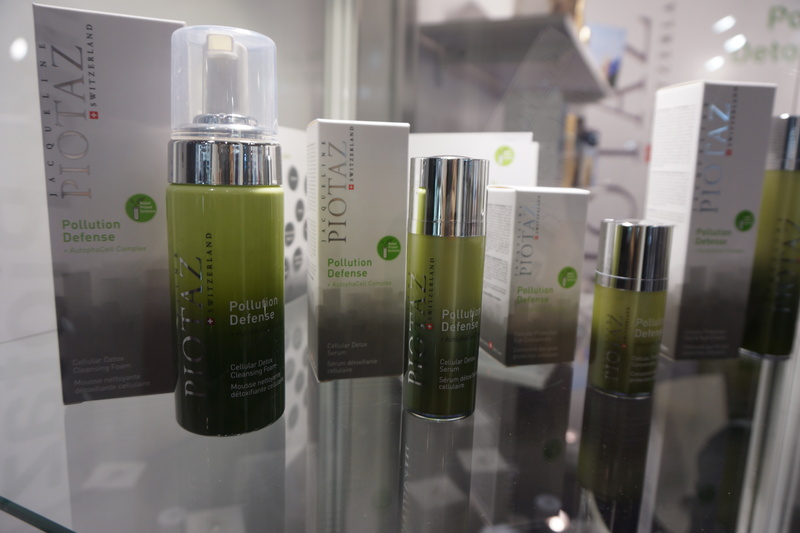 Although Pollution Defense is available internationally, Asia is one of the key markets for Piotaz’ new detox range. Swiss manufacturer Labiocos is a subsidiary of Swiss organic beauty company Farfalla. Labiocos operates a thriving natural and organic own label business and one of their organic beauty brands – manufactured for a Chinese client – is Edelswiss. The Edelswiss range was launched in 2016 and, as the name suggests, contains edelweiss extract as the key ingredient. 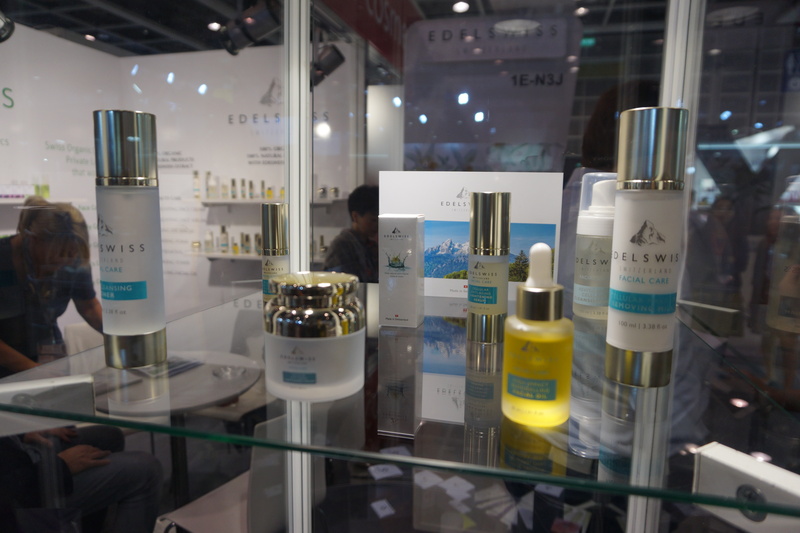 In mainland China, Edelswiss is retailed online and in speciality beauty stores but the brand is also available in Korea, Singapore and Malaysia. The Edelswiss portfolio includes three beauty ranges: Daily Care which comprises a body massage oil, hair & body wash and hand cream: the 6-sku fragrance-free Baby Care range of face & body cream, massage oil, shampoo, skin cream and protective roll-on and the 7-sku Cellular Whitening Facial Care range of cleansing milk, cleansing foam, cleansing toner, brightening serum, brightening face cream, moisturising face oil and eye serum. All Edelswiss products are certified organic by European certifier Natrue. 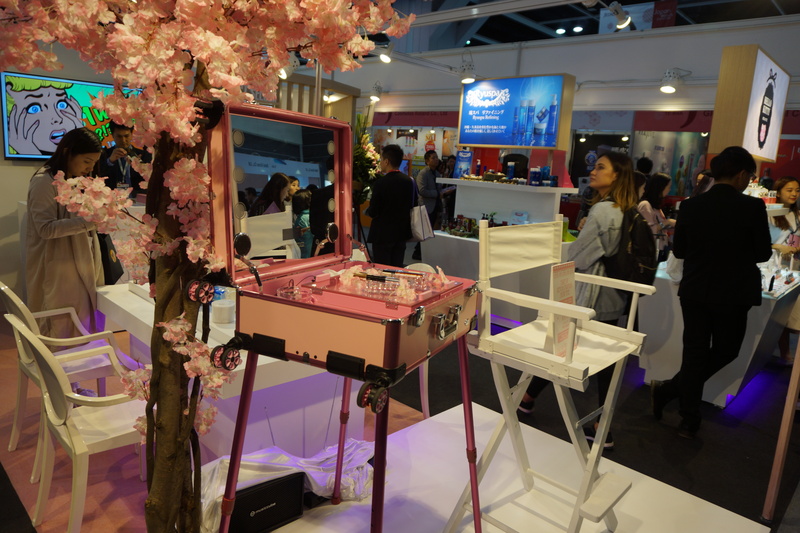 Swisskiss Lab is yet another Swiss C&T company which manufactures cosmetics especially for distribution in Asia, especially in China and Hong Kong. However, unlike Swiss-Asian super-luxe anti-ageing labels like La Colline or Swiss Programme, Swisskiss specialises in beauty products for babies and mothers. The brand was launched in 2012 and offers two beauty ranges: an Ecocert-certified 5-sku baby care range (see picture below) which includes a 2-in-1 hair and body wash, a face & body lotion, a baby cleansing milk, a diaper cream and an anti-stretchmark cream (this last one’s for mothers rather than babies, obviously!). All products contain Alpine water, Swiss mallow extract and aloe vera as well as the sugar-derived Bioecolia complex. The Mum’s Natural range (picture above) offers four products: a foam cleanser which contains organic elderberrry extract, raspberry extract and lavender water, an eye moisturiser with aloe very, hyaluronic acid and organic jojoba oil, a floral toner with organic elderberry extract, mint water and lavender water and a 24-hour moisturiser formulated with organic elderberry extract, lavender water, rice powder, apricot kernel oil and jojoba oil. 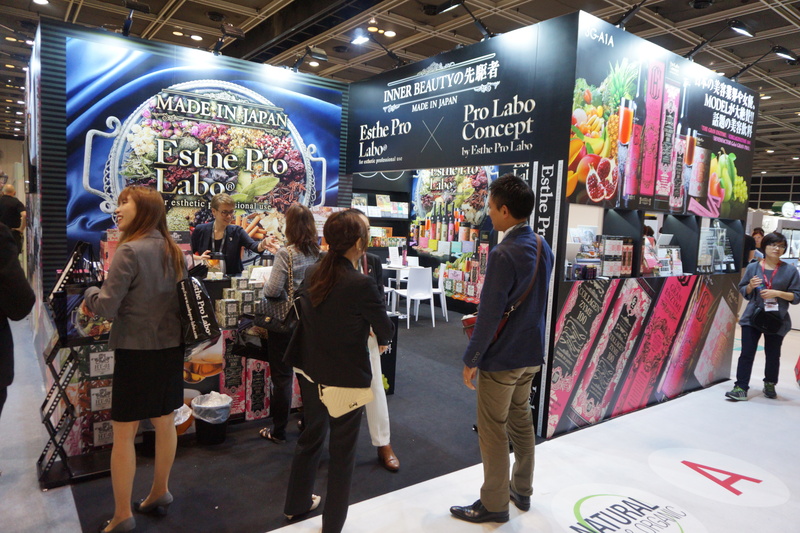 At the moment, products are only available in Hong Kong but the company is looking for Asian distributors. I’ve been a fan of Taiwanese mask manufacturer Maskingdom since I first discovered the brand in 2014 – you can read more about Maskingdom here and here. 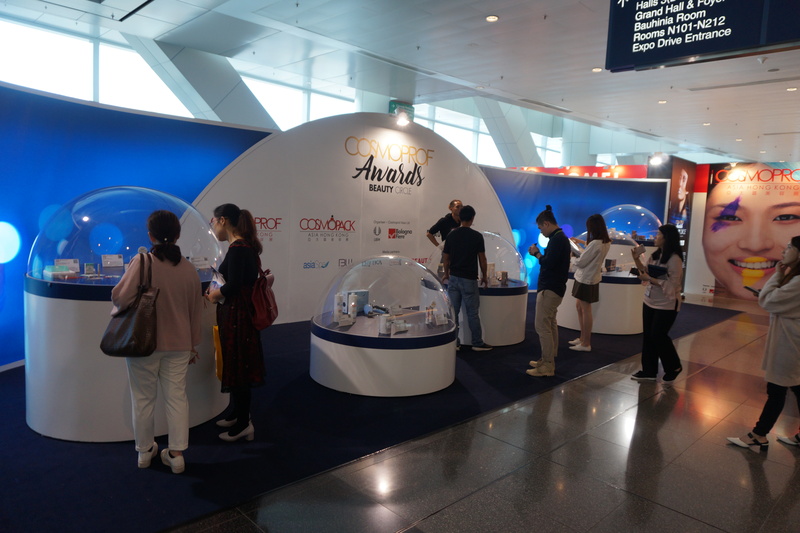 Every year I see the company at Cosmoprof Asia (as well as Cosmoprof Bologna 2017) and this year they were also at China Beauty Expo 2017 in Shanghai. 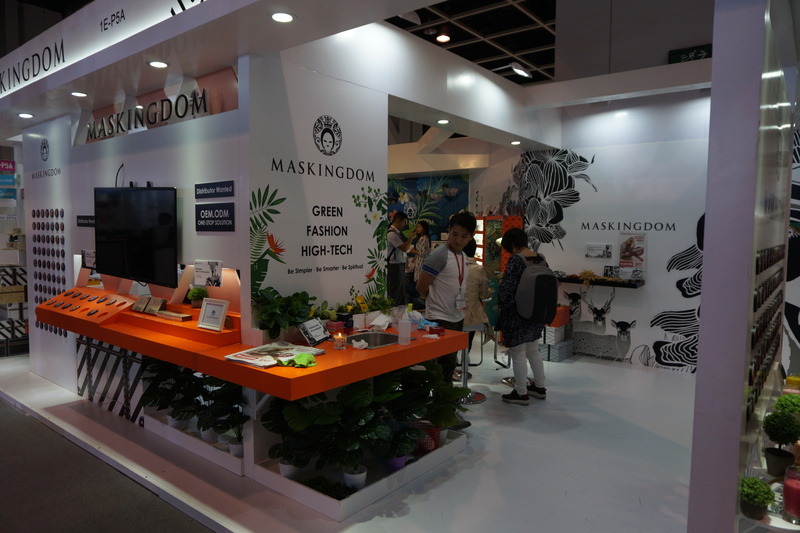 Maskingdom’s key focus is still its extensive sheet mask portfolio but over the last two years, a number of face care ranges, home fragrance products and other beauty products have joined the brand’s line-up. 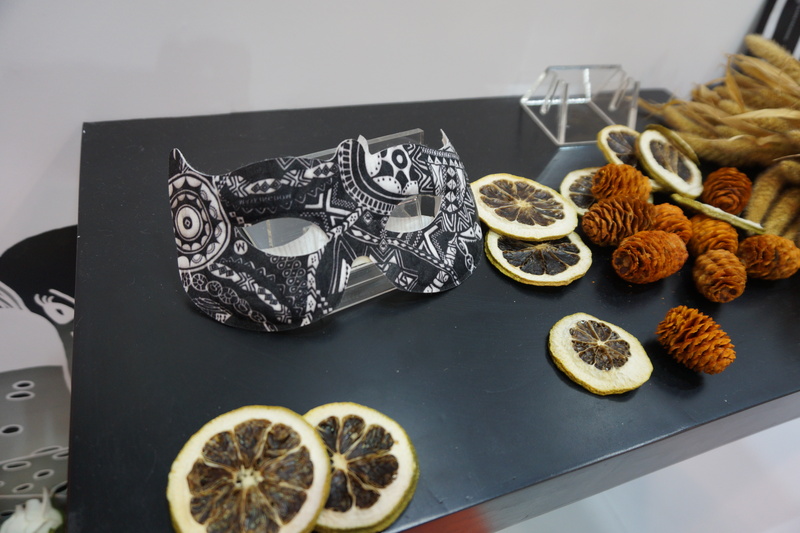 One of Maskingdom’s major new launches presented at Cosmoprof Asia 2017 was the Steam Eye Mask (see above), a two layer cotton mask with eyeholes. The inner layer is filled with charcoal and iron powder which heats up to around 40°C once you tear open the packet. The mask is designed to cover nine key acupressure points around the eyes and it remains warm for one hour, relaxing and soothing the eye area. Also new are a range of soy massage candles and two products which I had already seen at Cosmoprof Bologna: the fabulous Organic Cleansing Flakes (of which I bought a pack!) and and the Makeup Cleansing Cotton pads. The Cleansing Flakes are flat ultra-thin circles of a papery-looking solid cleanser which foams up quickly and surprisingly creamy once it comes into contact with water. It reminded me a bit of the „paper soaps“ that were so popular in the 1980s and 1990s but unlike these square soap sheets, Maskingdom’s Cleansing Flakes dissolve thoroughly and won’t leave behind papery bits or soap fragments. The Flakes are soap-free, alcohol-free and the ingredients are completely organic. Seriously impressive. 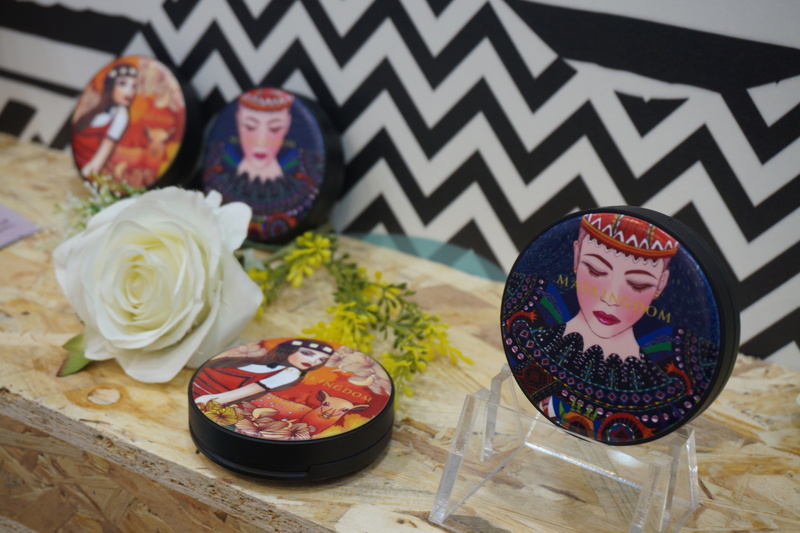 The Cleansing Flakes are packaged in a plastic compact (see picture above) which is available in four different designs from Maskingdom’s iconic Taiwanese Aboriginals sheet mask imagery (which received a Red Dot Design Award last year). This innovative cleanser was also selected as a Natural & Organic product entry in Cosmoprof Asia 2017’s Beauty Circle Awards. Shangpree is an interesting (and almost organic) Korean spa brand which was launched back in 1990 with a single beauty salon. Today the company operates five luxury spas in Korea (three of these are located in Seoul). The company’s products are available in high-end international department stores like Harrods and Harvey Nichols in the UK, La Rinascente in Italy and Barney’s New York in the US. And in Asia, of course. 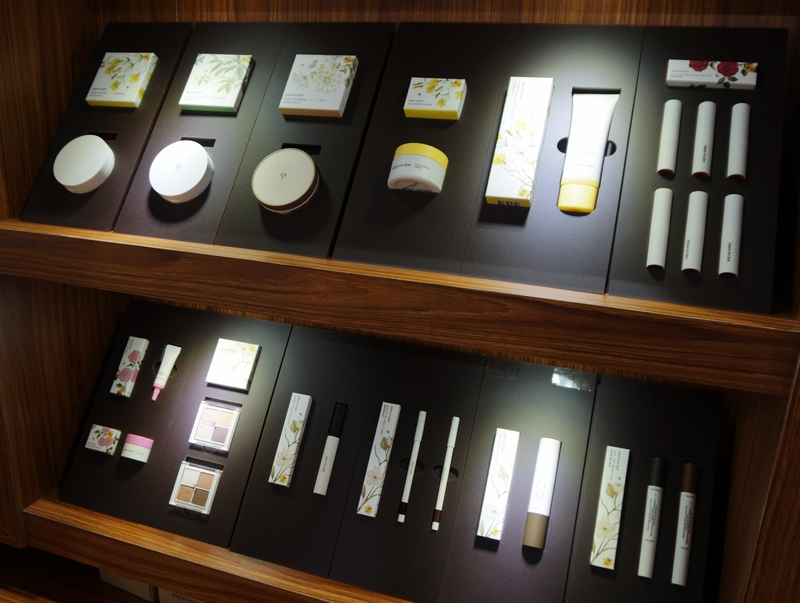 I had seen Shangpree’s products in some of Seoul’s luxury department stores (like Shinsegae and Lotte Mart) so I knew that this was a premium spa brand but I had never really looked at the products in more detail. 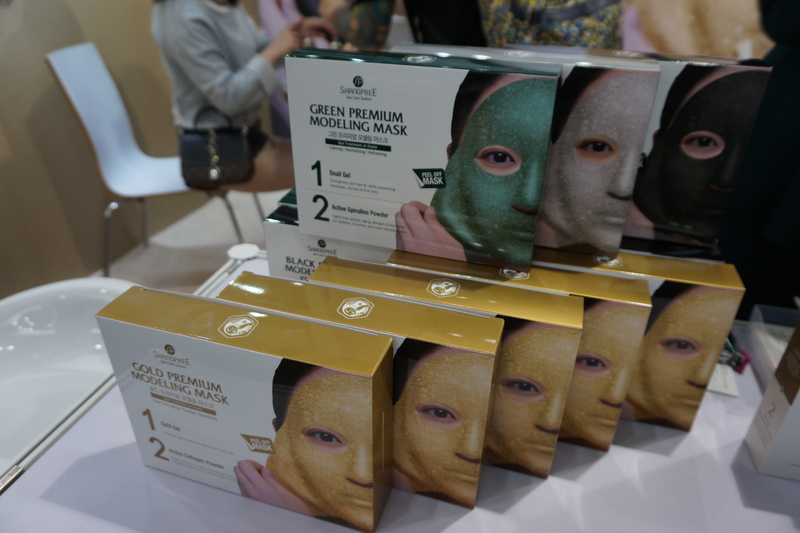 At Cosmoprof Asia, the brand presented several of its retail beauty ranges (mostly face masks) and what can I say: the first three quarters of each INCI list were – as far as I could tell – organic ingredients only. Some synthetics were listed towards the end but compared to other Korean brands, the number of chemical ingredients was (surprisingly) small. The line-up includes four Premium Modelling Masks (rubber masks) for different skin concerns – these are two-part masks; the alginate gel is blended with collagen powder. Gold (firming and nourishing) is formulated with gold extract, Korean ginseng and caviar, Silver (brightening and moisturising) contains silk amino acids, pearl extract and niacinamides; Black (pore-refining and purifying) contains activated charcoal, witch hazel and soybean powder while Green (calming, soothing) is formulated with spirulina and chlorella powders and green tea. There are also three Premium Ampoule Modelling Masks (alginate powder plus intensive ampoule serums) and the under-eye hydrogel Gold Eye Mask range: four variants with ingredients such as black pearl extract, algae powder, ginseng and berry extracts. 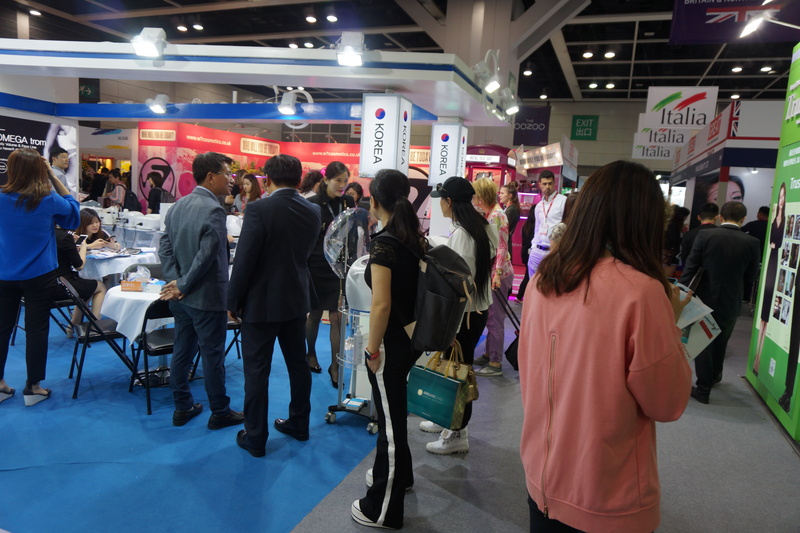 In Korea, Shangpree has a much bigger skin care portfolio which includes cleansers, intensive treatments, brightening and anti-ageing products. I knew Papa Recipe as a popular Korean beauty brand (their honey sheet masks seem to be everywhere on Instagram) but had never actually looked at the products in more detail. However, the brand was at Cosmoprof Asia and I found myself standing in front of their booth, so here we go. 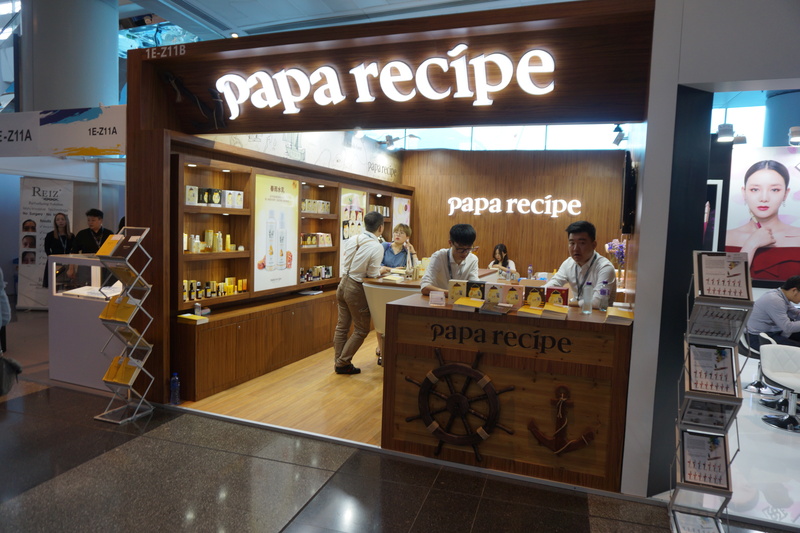 Papa Recipe was launched in 2012 by a father who wanted to develop skin care for his daughter – hence the brand name – and began formulating honey-based beauty products. 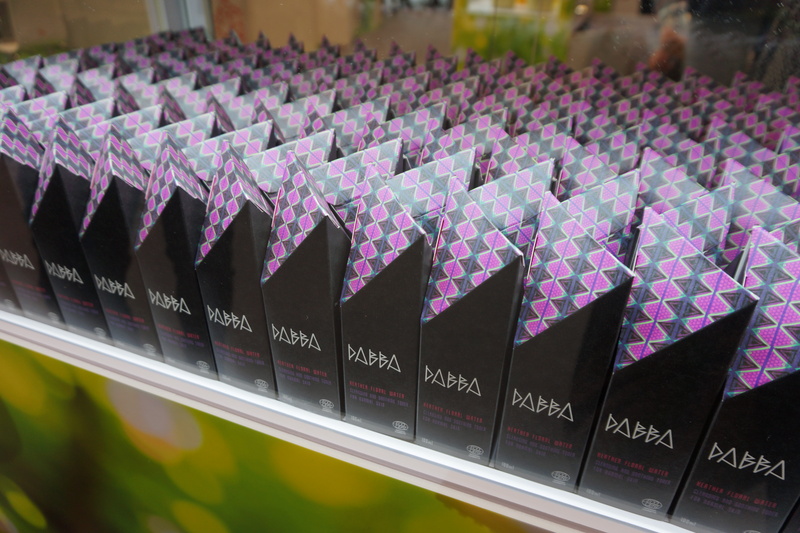 Every product in the Papa Recipe portfolio contains honey extract and the line-up includes the Bombee Honey Mask range (those are the sheet mask you see on social media everywhere), the 5-sku Peel Off Mask range (cream masks which are packaged in tubes) which features variants with charcoal, cacao, honey, foil (silver particles) and gold as key ingredients, and the Bombee Moist Face Care range. In addition, Papa Recipe sells the 6-sku Honey Moist line (for dry skin, see pic below), the 6-sku Eggplant Clearing range (for oily/combination skin), the 5-sku Tea Tree line (for combination/problem skin) and the 4-sku Seawater Pore Tightening range which is, well, pore care. There are also four sun care products, a number of jelly masks and other rinse-off masks variants and four bar soaps. 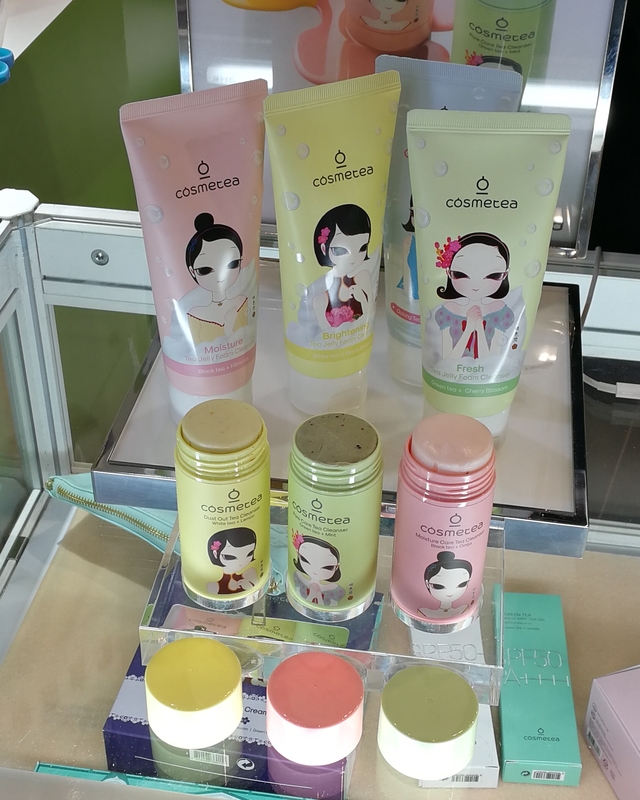 Papa Recipe’s latest launch is a beautifully packaged colour cosmetics range, Color of Spring, which was introduced in Korea this July but will be rolled out internationally soon (see picture above). 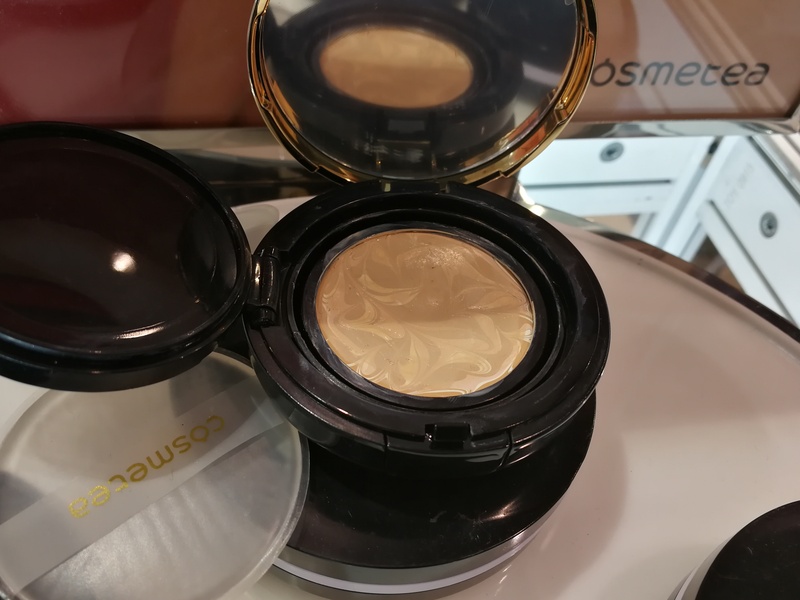 The makeup line includes three cushion compacts with SPF50 for different skin concerns, the Plus Tone Up Cream (a primer), a contouring sticks, two bvrow mascaras, six lipsticks, a lip scrub, and intensive lip balm, a mascara and two eyeliners. 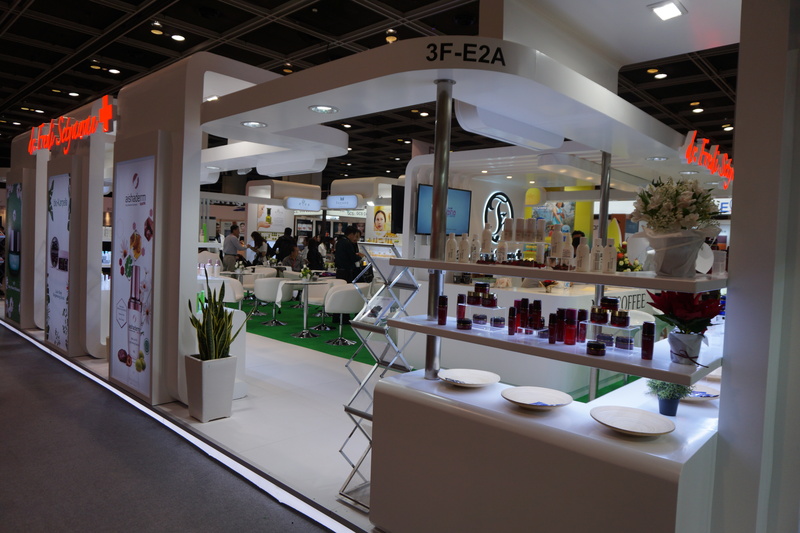 Right next to Papa Recipe’s exhibition booth was Vivlas, a Chinese makeup brand which belongs to Papa Recipe’s Chinese distributor. 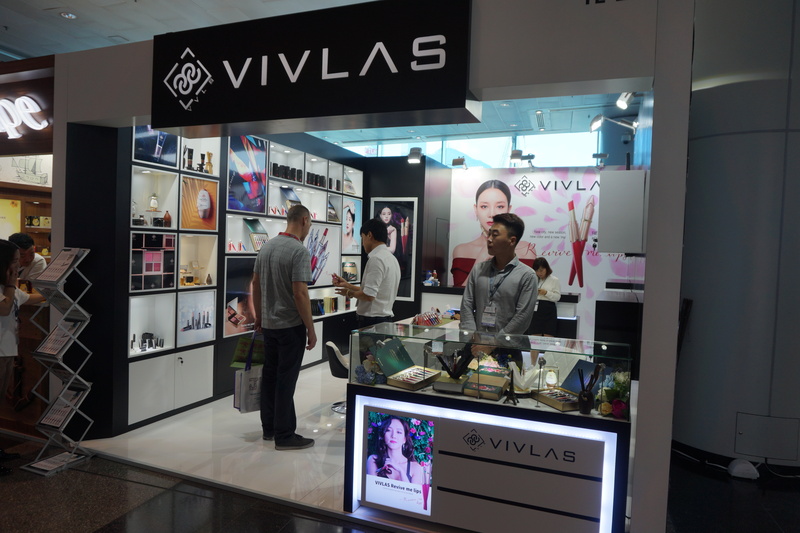 Vivlas was launched in 2016 and is currently available in Korea (where the products are sold in department stores, duty free and online) and, of course, in its home market China (online retail only). All Vivlas products contain black tea extract and I particularly like the packaging of their lipsticks (see pic below); they look like fountain pens! 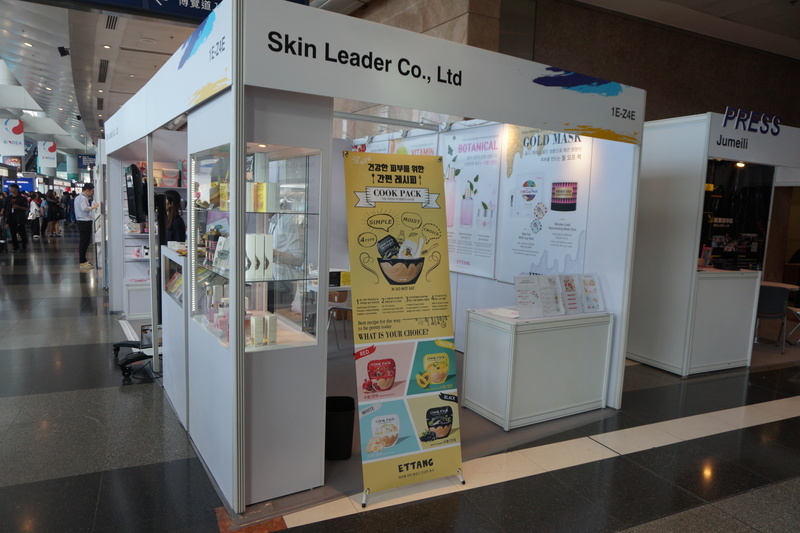 Korean C&T brand Ettang (the manufacturer behind the brand is Skin Leader) was also at Cosmoprof Asia. 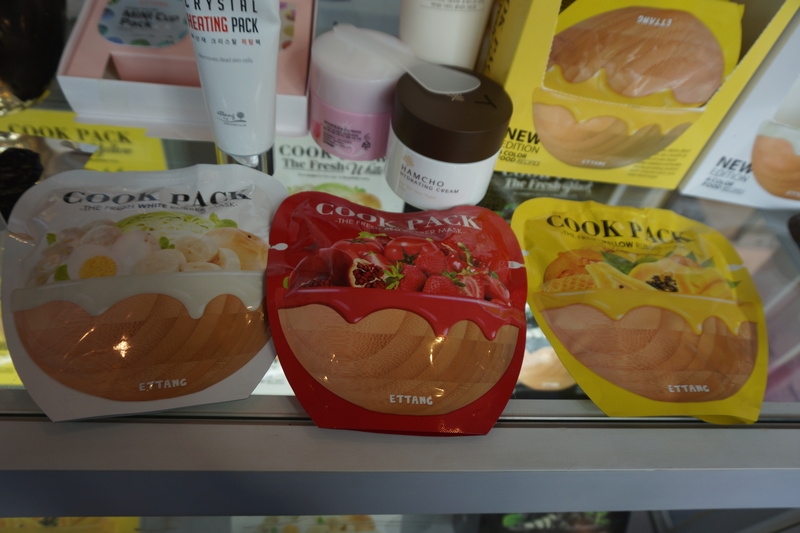 Ettang sells a wide range of different mask formats – modelling masks, sheet masks, jelly masks and so on, a standard Korean face mask line-up – and this year they presented a new launch, the modelling mask Cook Pack. Classic modelling masks (which are also called rubber masks) consist of an alginate-based powder which is stirred together with a liquid – usually water (like in the Lindsay rubber masks) but there are also modelling masks which come with a serum, gel or other liquid ingredient which is then blended with the powder. Cook Pack claims to do away with the untidiness of powder spilling everywhere (and yes, traditional modelling masks can be a teensy bit messy) by offering a modelling mask which is entirely powder free – instead there are two gel phases that are simply stirred together. 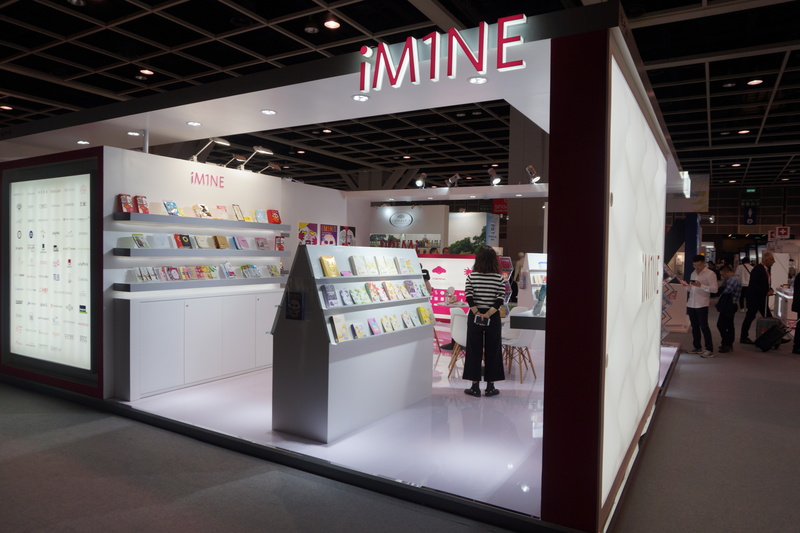 Korean face masks manufacturer iM1ne’s I’m Sorry for My Skin pack design is striking – each sheet mask features an image which illustrates one of the reasons for bad/tired skin (smoking cigarettes, drinking alcohol, eating sweets, sun exposure). iM1ne was at Cosmoprof Bologna this year and their exhibition booth was surrounded by a mob of people all snapping pics of the I’m Sorry for My Skin mask range! Anyway, the original I’m Sorry For My Skin range has now been extended with a number of other products, like the Purifying Jelly Mask (the tube you can see in the picture) and the Water Boom Jelly Mask (two variants, packaged in jars). I also saw a two-part I’m Sorry for My Skin mask sachet at the booth which contained a peeling cloth and a sheet mask. 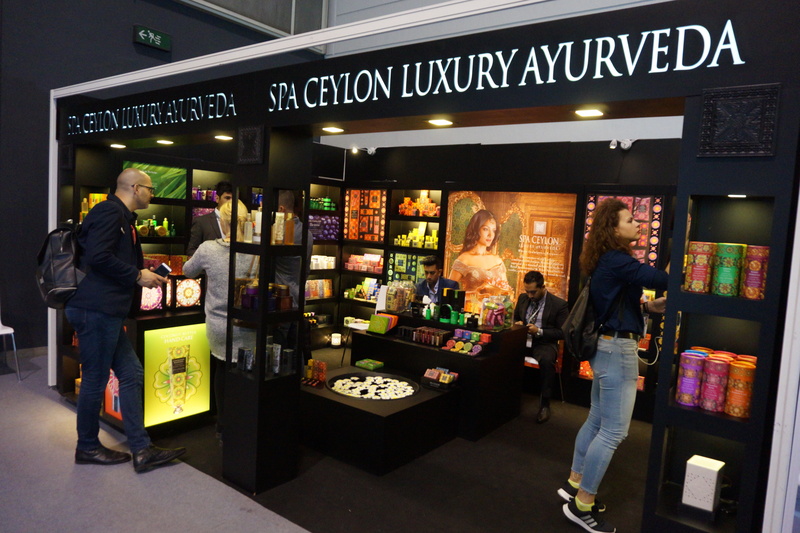 One of the most striking-looking exhibition booths in Hall 1 was definitely Spa Ceylon Ayurveda from Sri Lanka. The home spa beauty brand was launched in 2009 and they currently operate 58 outlets in 12 countries, including India, Pakistan, Bangladesh and Sri Lanka but also Singapore, Malaysia, Korea, Japan, Australia and Turkey. The beautifully-packaged products are sold in Spa Ceylon branded stores which typically offer some 500 sku of bath and body care, face care, home fragrances and perfumes. Now Spa Ceylon Ayurveda has set its sights on conquering the European market. The company has just finished product registration for the EU market and in 2018 they hope to open their first stores in key Western European markets like he UK, Germany and France. As far as home spa cosmetics are concerned, the leading chain in Europe is Rituals from the Netherlands. 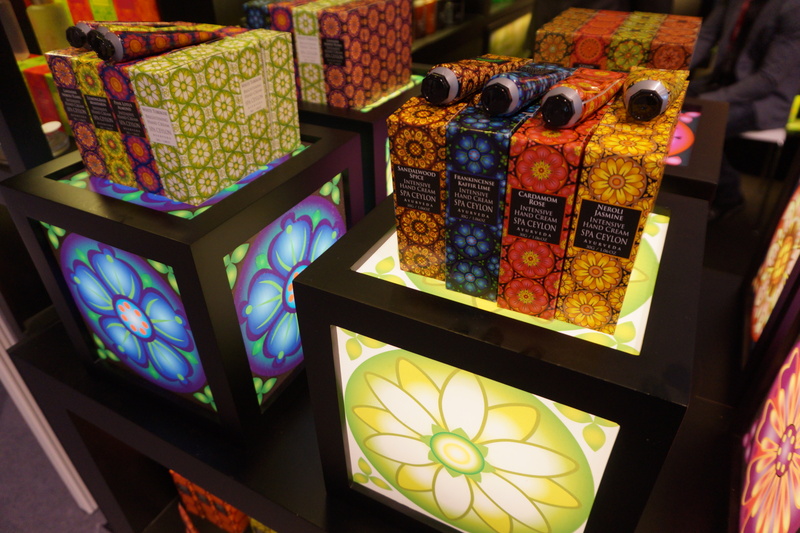 Rituals has been expanding consistently over the last five years (there are so many Rituals stores in Berlin now) but I can easily imagine Spa Ceylon Ayurveda pulling ahead with its eye-catching packaging design and – let’s face it – much cleaner product formulations than Rituals. The price point, by the way, is around 10 USD for the hand creams; bath and body care costs around 20-25 USD and face care is priced at 30-35 USD. The brand’s latest launches include a men’s range which was introduced in early 2017 and the divinely-smelling 7-sku Virgin Coconut range which was launched in August 2017. Japanese company Molza is a paper manufacturer and one of their specialities is the production of traditional washi and shoji paper products for industrial purposes. Check out their home page, I had no idea that the delicate-looking washi paper (which I only know as a decorative material, for example as origami paper) can be used for so many household items! 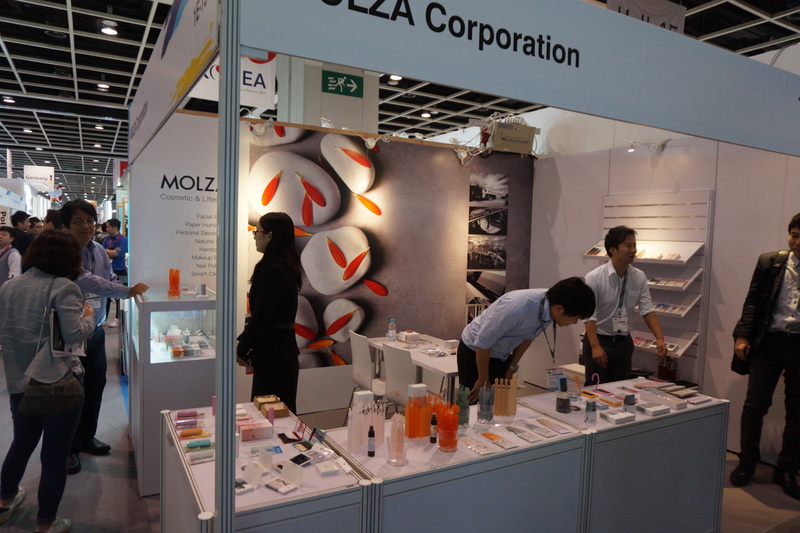 At the trade show, Molza presented some of its paper-based home fragrance and beauty gadgets. At first glance I didn’t know what the pretty-looking paper cut-outs in the waterglass were supposed to be (see pic above) – they looked a bit like scissor art or paper fans– but they are actually humidifiers which are cut from very thin, stiff paper. You unfold the cut-outs and place them in a glass of water; add a few drops of essential oil if you like a bit of fragrance. The paper will then draw up the moisture and very gently dispense it into the air. The bath and body care products of UK brand Prismologie combine colourtherapy and gemmotherapy in a strikingly-packaged 12-sku range. The line-up is divided into six therapeutic colours which feature two products each. Colours and scents of the products have been selected to boost the therapeutic properties and each colour range also contains a specific powdered gemstone. White blends the uplifting fragrance of neroli with the purifying properties of diamond powder. Moodlifting Yellow combines citrus notes and powdered citrine, Green is vetiver-scented and contains jade stone while Red is cedarwood and ruby. Finally, Blue combines aromatic oud with sapphire powder. Prismologie was launched in 2015 and its products are sold in selected retailers in Germany, the US and the Gulf countries. In the UK, Prismologie is retailed in London luxury department stores Harrods and Selfridges as well as John Bell in Croydon. Pretty by Flormar (see pics below) is a new subrange launched by Turkish colour cosmetics brand Flormar to address its more teenaged female customer demographic. The packaging is playful and cute, prices are around 20% cheaper than Flormar’s standard range and there is a wide range of colours to chose from. Pretty by Flormar was launched in March 2017 and the brand is already distributed in 30 countries across the world. Of course I also enquired about when and if Pretty by Flormar would be available in Germany and it appears that Flormar is aiming for a drugstore distribution. On the one hand this is a logical choice since drugstores are by far the biggest retail channel for mass market colour cosmetics in Germany. However, Germany’s three big drugstore retailers DM (market leader), Rossmann (second in line) and Müller (the third-largest drugstore chain) already sell a number of very well-known and immensely popular entry-level makeup brands – Cosnova’s Essence and Catrice, for example (Essence in particular offers an almost unbeatable ratio of price and value), Maesa’s P2 and Coty’s Manhattan. 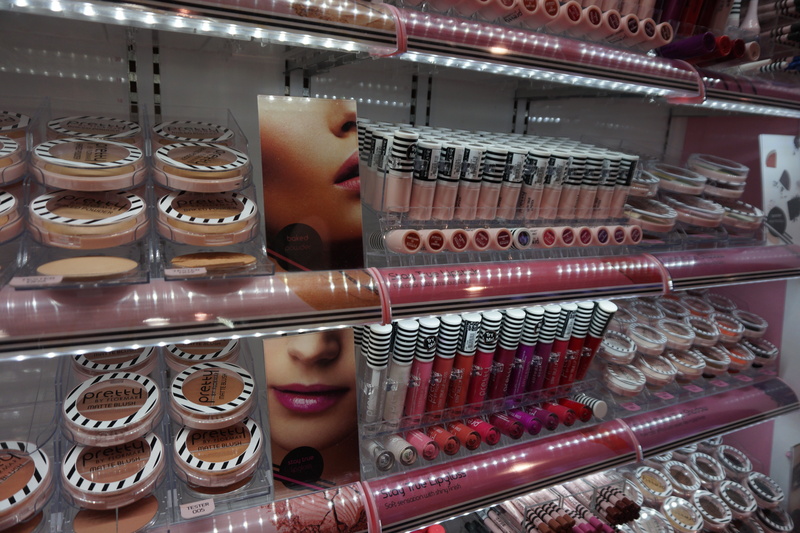 And last year, DM and Rossmann both began retailing L’Oréal-owned makeup brand Nyx (which has stepped up its international expansion ever since L’Oréal aquired the brand from South Korean founder Toni Ko in 2014). It should be interesting to see how Pretty by Flormar’s expansion plans for the German market will pan out – I think they might find the mass market colour cosmetics sector quite challenging. 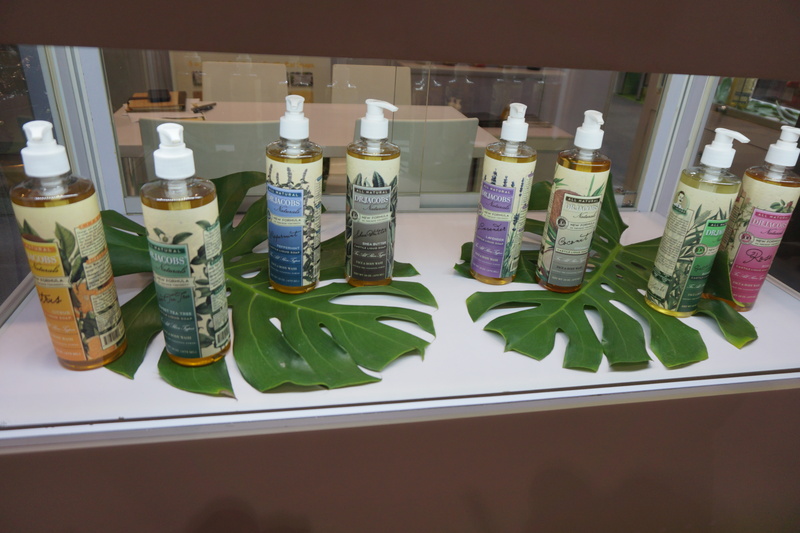 Italian natural cosmetics beauty brand L’Erbolario is at Cosmoprof Asia every year; East Asia and South East Asia are very important markets for the Lombardy-based C&T manufacturer. The company always has a beautiful booth very close to the middle entrance doors of Hall 1. 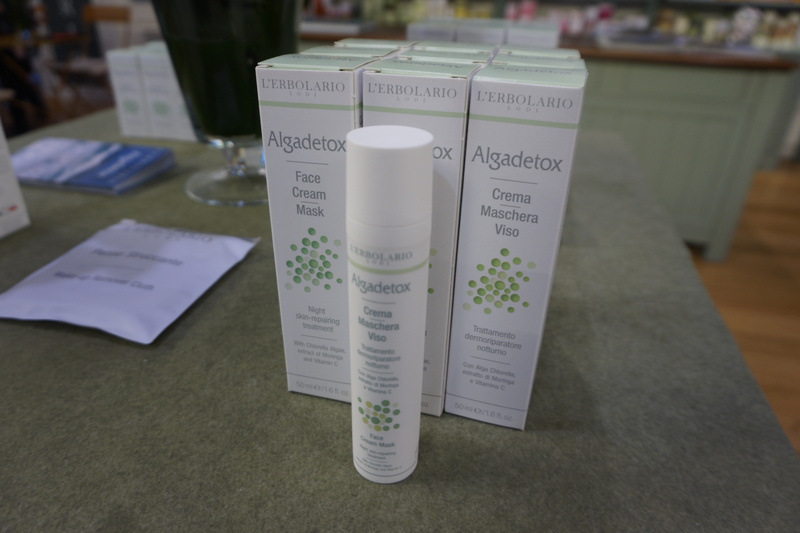 In 2017, L’Erbolario’s new launches included two scented bath and body care ranges – the sultry Indigo and the more floral Lilac range – as well as an interesting detox skin care range, Algadetox, which was introduced this September. See pic above. As the name suggests, the four products in the range contain algae extracts and moringa oil to help protect the skin against pollution, sun exposure and other damaging environmental influences. The line-up includes the Cleansing Exfoliating Face Oil-Gel with jojoba particles (a clear liquid jelly formula that turns into a milky foam once it comes into contact with water), a Day Face Cream with SPF15, a Face Cream Mask (which can work as a night cream or a sleeping pack) and the Face Beauty Activator which is an oil blend that can be used to add lipids to the day or night cream. 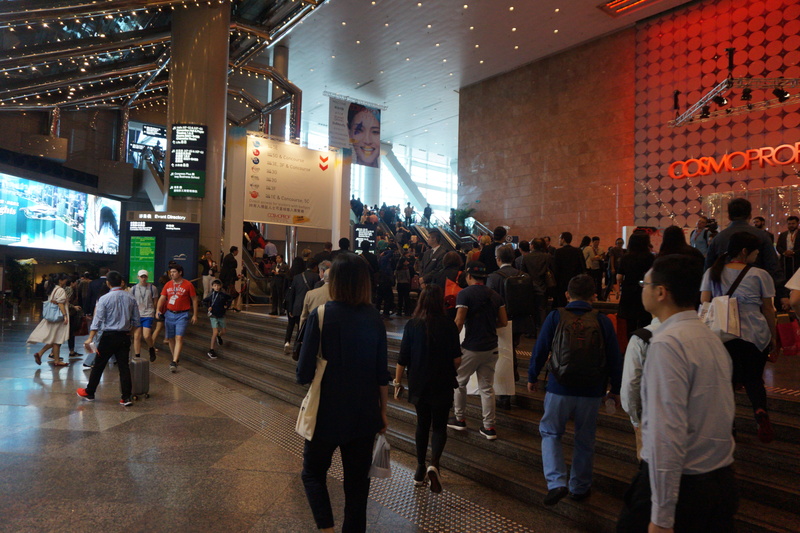 I also spent a few hours up in Hall 5 which is located on one of the top floors of the HKCEC. Most of the first-time exhibitors and independent beauty brands had their exhibition booths in this hall. 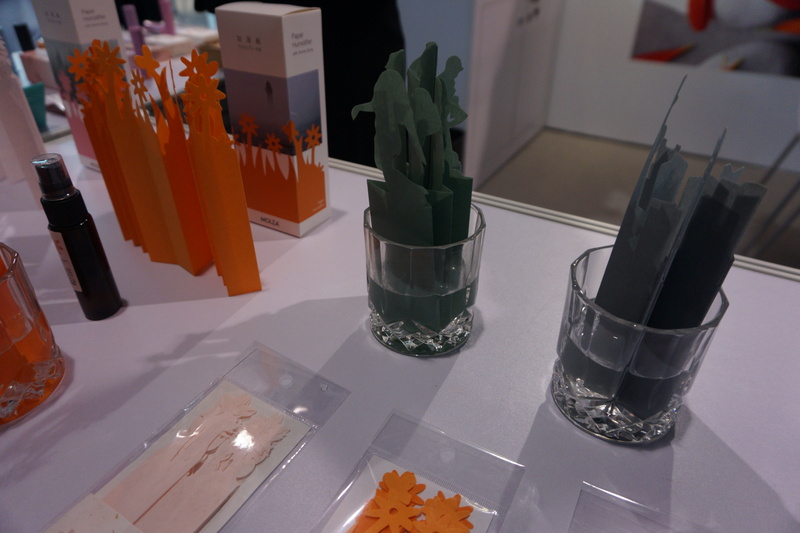 One of the Hall 5 exhibitors was Korean brand Cosmetea which was launched three years ago. Cosmetea offers tea-based skin care (using tea water as a base) and the face care line-up includes three cleansing sticks with different textures, three jelly foam cleansing gels, two types of clay masks and three sheet mask variants. Cosmetea also offers a number of makeup products, including the Tea Latte Tone-Up Cream (a primer), a CC cushion and the intriguing-looking Milk Tea EE Cream cushion (see pic above), a blend of milk essence, makeup base and foundation all swirled together in the cushion compact. Incidentally, I saw this kind of marbled foundation cushion at quite a few Korean exhibitor booths – and no wonder, this type of foundation looks fabulous and demonstrates that several ingredients are packed into the product formula. 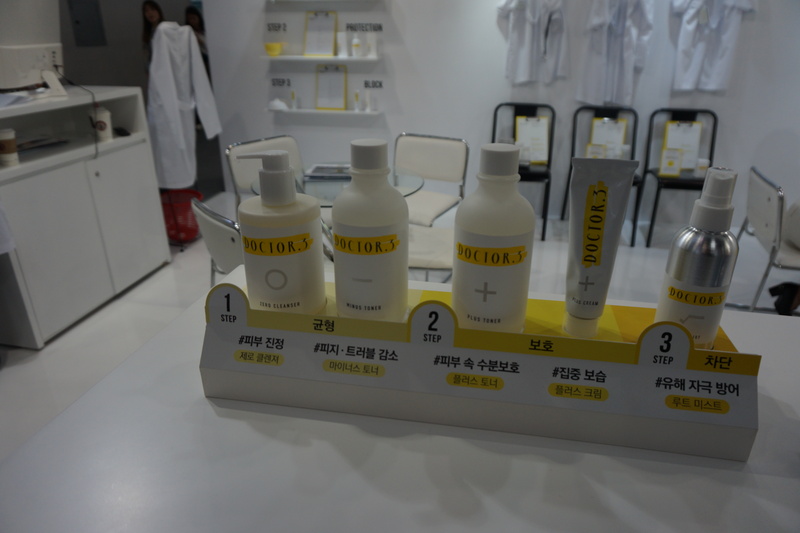 And more beauty from Korea: Doctor.3 is a super-stylish dermo brand which was launched just last month. Unlike the classic Korean layering skin care routine, Doctor.3’s pared-down product range features just five steps: the Zero Cleanser, the purifying Zero Toner, the moisturising Plus Toner and the rich Plus Face Cream. The final product is the spray-on Skinshield Root Mist which can be used as an additional hydrating boost. Doctor.3’s packaging is clean and chic; designed to appeal to a younger, more urban clientele (I’d imagine). Nice-looking products. 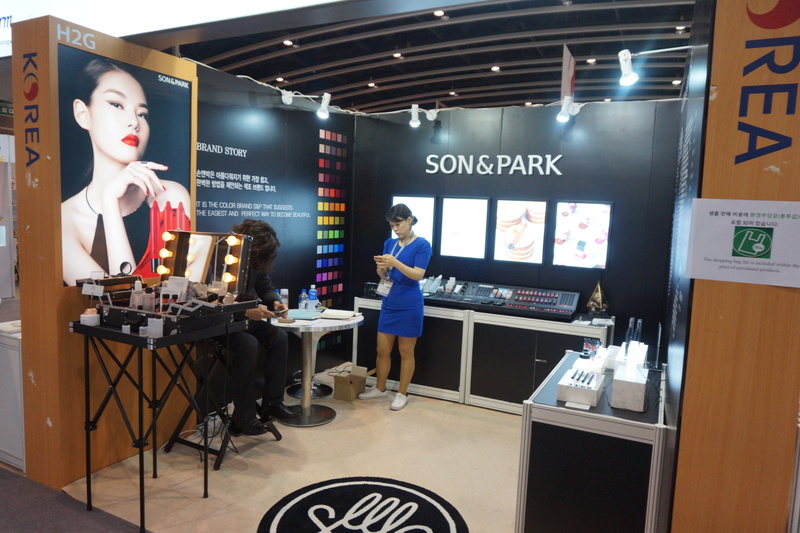 Another Korean exhibitor in Hall 5: Son & Park, the cult makeup brand which was founded by two Korean makeup artists. Son & Park is sold in most international Sephora perfumeries and in US K-Beauty online stores like Glowrecipe; they have a dedicated (and very large) fan base. 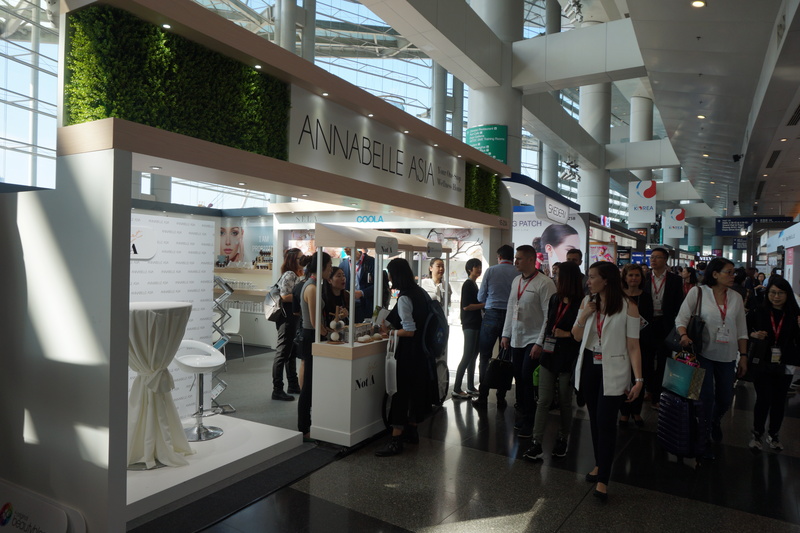 I was a bit surprised to see the brand at Cosmoprof Asia (also, Hall 5 is rather, ahem, quiet) but I was told that the company is looking to expand its international distribution; hence their presence at the trade show. Son & Park’s latest launches include the Beauty Filler Cream (a primer), a range of beautifully-packaged lipglosses, a line of triangular-shaped twist-up creamy eyeshadow pencils and two double-ended mascarabrow combs. 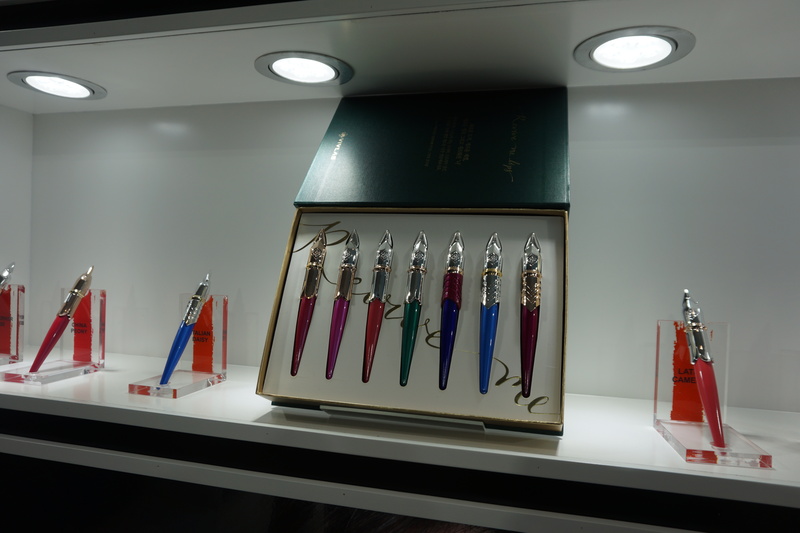 The Beauty Circle Awards were a new feature at the trade show this year. Exhibitors could nominate their new product launches in one of the six categories (Make-Up Product, Skin Care Product, Nail Product, Hair Product, Natural & Organic and Best Beauty Brand Online) to be judged by a panel of jury members. I must admit that I didn’t know any of the winning brands and I was disappointed that Taiwanese C&T manufacturer Maskingdom’s Organic Cleansing Flakes (a nominee in the Natural & Organic category) did not win – it’s a shame because the Cleansing Flakes are a true product innovation. Anyway, these were the winner of the Cosmoprof Awards Beauty Circle 2017: Prime & Behold, a makeup primer from UK brand Wunder 2 (Make-Up Product); Plabeau, a plasma-emitting skin care device (?) from Korean brand Plabio (Skin Care Product); the Manucurist Mirror Effect Kit from French nail care brand Manucurist (Nail Product); hair colourant Colour Us Vibrant Party from Slovenian brand Studio Ma (Hair Product); spray-on fragrance Eau de Parfum Encapsulated Queen Next Door from French fragrance brand Gellé Frères (Natural & Organic) and Gellé Frères Encapsulated Queen fragrance also won the Best Beauty Brand Online Award. Better luck next year! 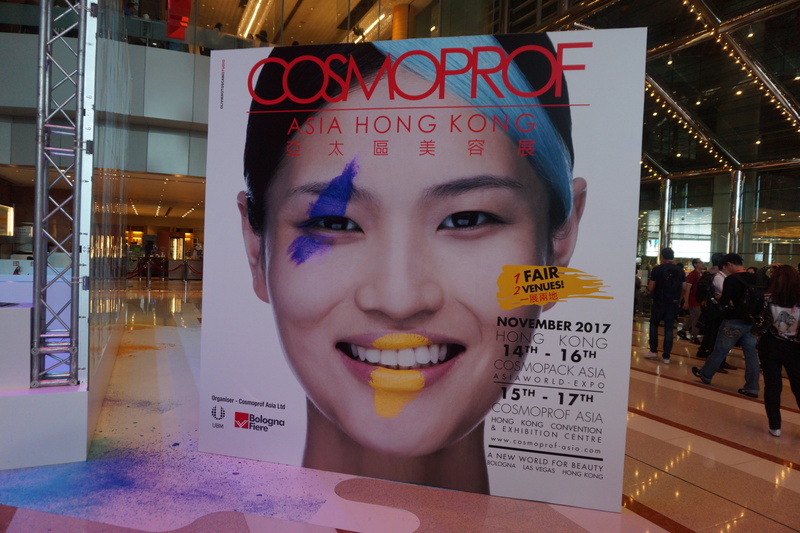 Cosmoprof Asia 2018 will take place from 14th to 16th November 2018 (Cosmopack 2018: 13th to 15th November 2018) and I have already reserved my Wan Chai hotel…!